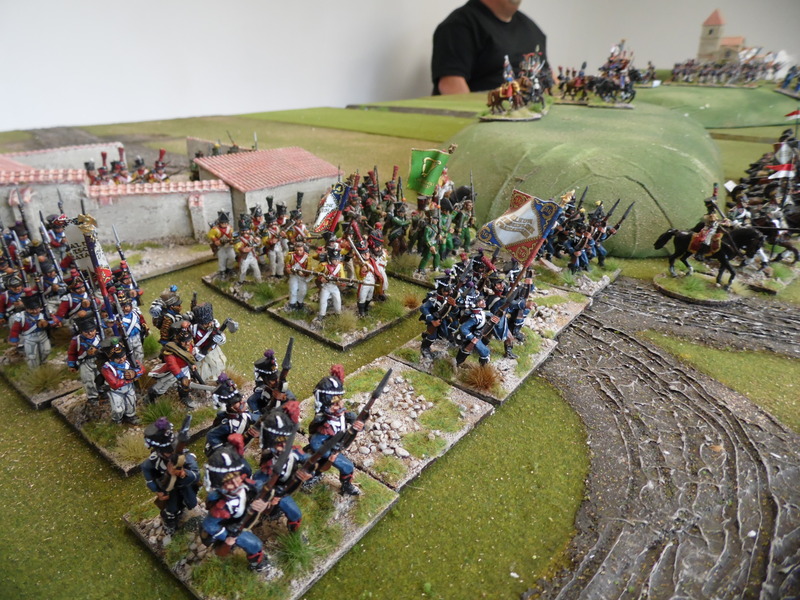 The consensus of the usual players was for a Napoleonic Game. 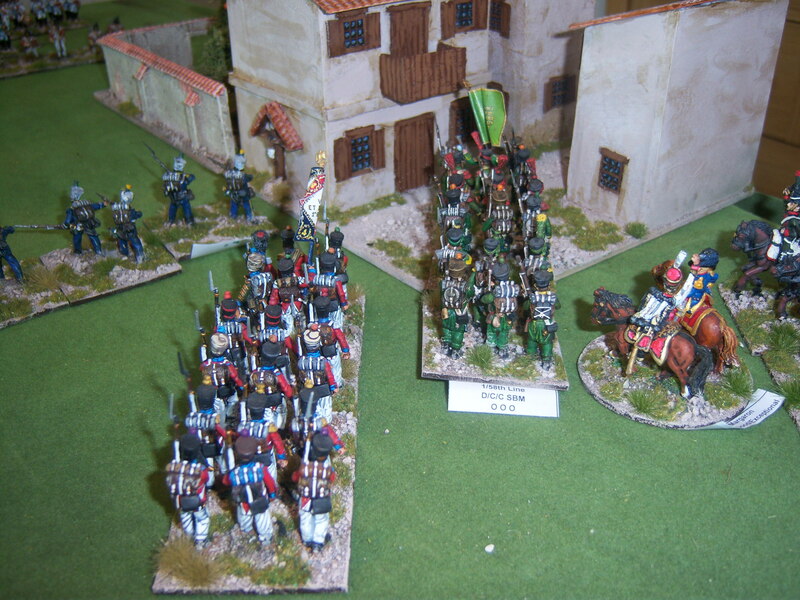 Having recently visited the Elite Miniature website I spotted a great scenario on there. I decided to give it a try. The basic plot is that a Spanish garrison is holding a town blocking the advance of the French. The British with a few Portuguese are rushing to help save the day. 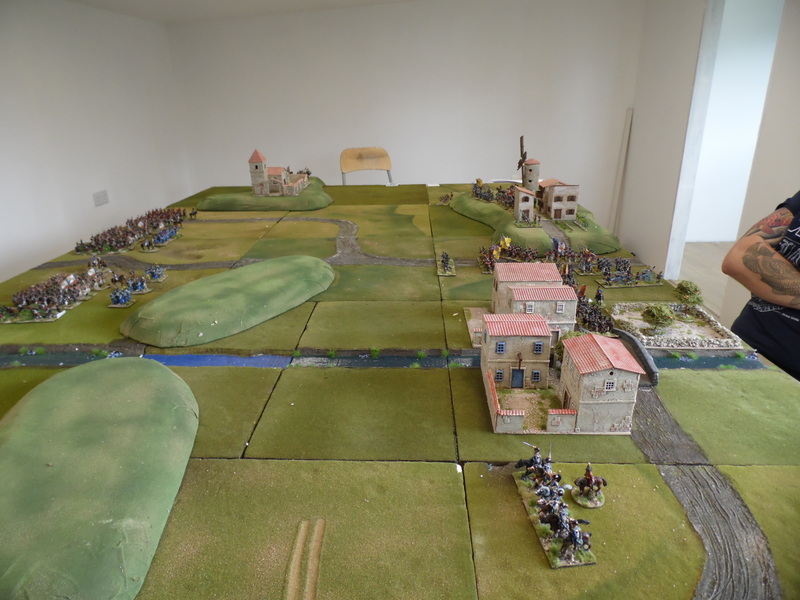 The table was 9×5 and dominated by 2 large tree covered hills and a large town in the the centre. The focus was the town and this would be the first time this type of feature had such a prominent role in one of our games and would test the rules. French commanders 1,2,3 and 4 and their direct commands were placed on the French table edge. The Spanish were the only Allied units on the table and they were holding the town. 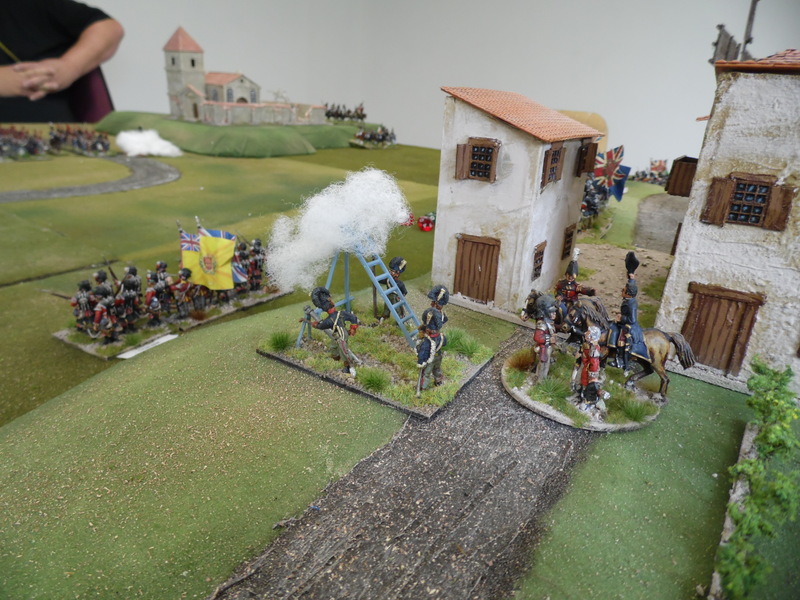 Initially one unit holding each quarter of the town, artillery on the road deployed facing the oncoming French and the Dragoons outside awaiting a suitable target. French Chasseurs advance through the wood on the hill while their artillery fires on the town. Over there Sire. Wellington is made aware of French forces coming over the hill. Portuguese finally arrive, too late? 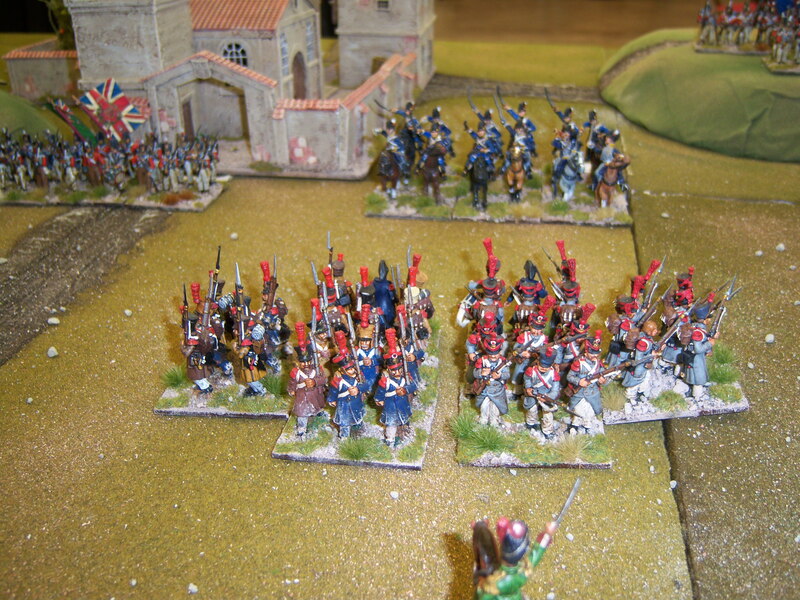 The main French attach lead by Brigadier Heller advanced towards the village in columns with skirmishers to the front. 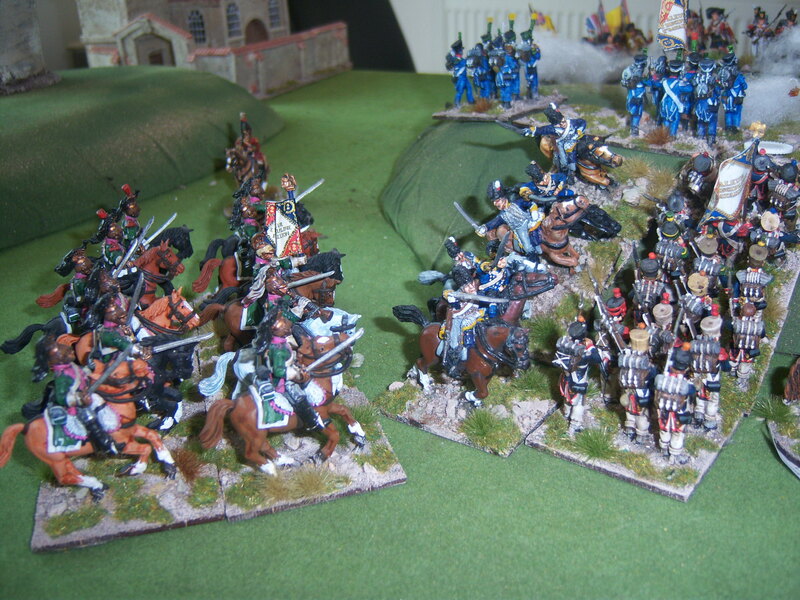 As they got close the Spanish dragoons fancied making a name for themselves and charged. 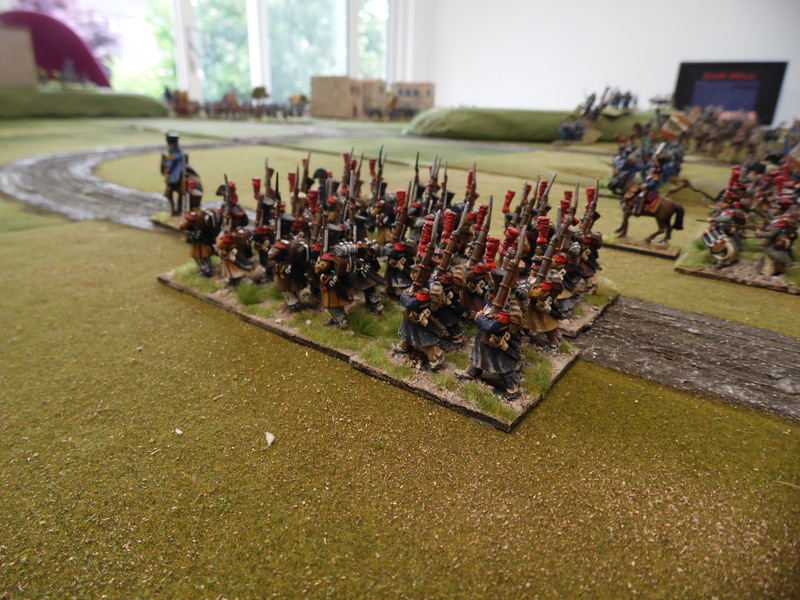 They contacted a unit of skirmishers before they had a chance to fire ( They decided to stand and fire but rolled a score on the fire dice for the range at which they fired that was greater than the distance to the cavalry). This meant they were automatically wiped out. 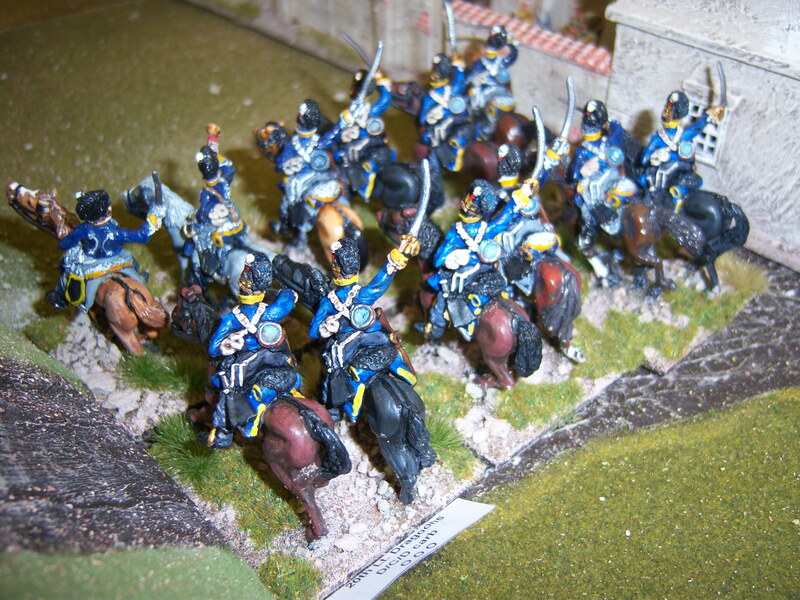 The dragoons realising how easy it was carried on into the French columns. 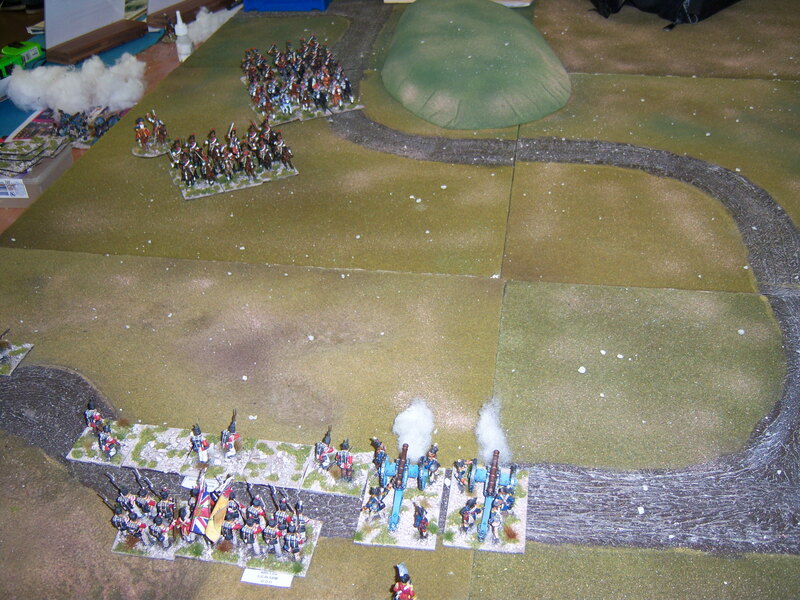 Here they hit a column before it could get into square but it held and for the next couple of turns a furious melee was acted out which ended in the dragoons being wiped out although they had inflicted some damage to the infantry. What this really did though was to brake up the attack so that not all the French hit the town at the same time! This gave the Spanish to move all the infantry to the half of the village nearest the French. 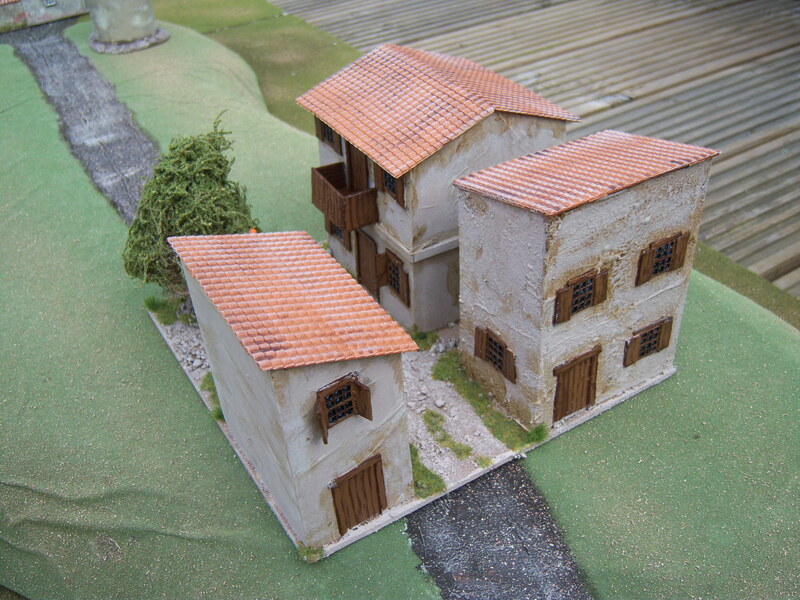 In our rules each building represented can hold a battalion. Attacking the town gives the defender a +2 advantage. To get into the town the Spanish must either be destroyed or vacate a building which would allow the French to move in and then fight house to house). Over the next 6 turns the melee continued to ebb and flow with both sides at times thinking they had carried the fight. 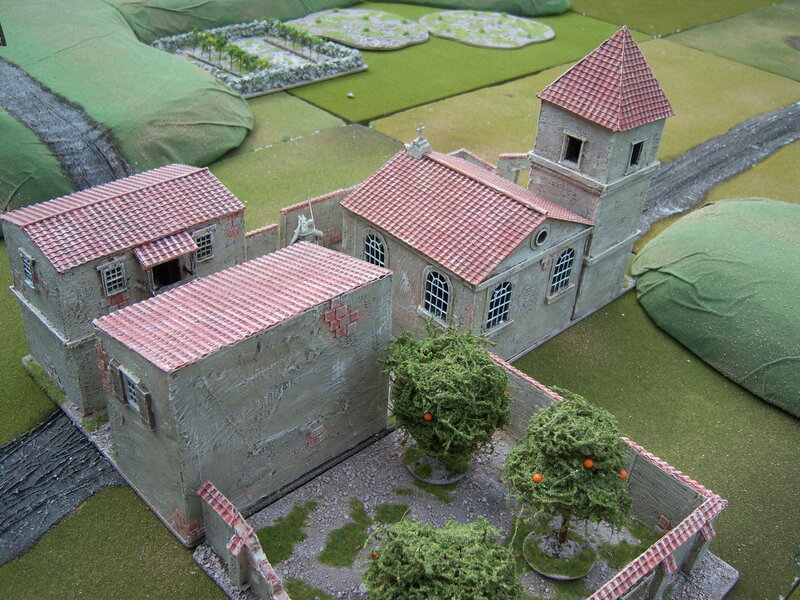 Unbelievably the Spanish morale held even though casualties were building. In the meantime more French had arrived and were moving through both hills to envelope the town. the horse battery deploying on the hill to give supportive fire into the town. The British had also started to arrive. Deploying either side of the road and bracing for the expected French attacks. Back in the town the fight was grinding to an end. The Spanish had gallantly fought to the last man. The artillery being the only surviving unit but that was in full route, not being rallied before it routed right off the table. The town was open for the taking. How could get to occupy it first? This was were the British were given a life line, by the French! A random event was drawn and it was “The master spy” card. This allowed the next activation card to look at the follow 6 activation cards and rearrange into an order that suited them. A very powerful card. This could have allowed the french to activate their units first and then place the “end of turn” card before any British card. 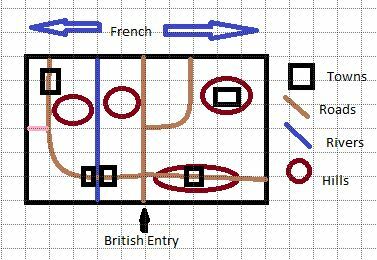 Unfortunately this did not happen and in a panic the French place the End of Turn card as the next to be drawn, therefore ending the turn. Next turn the British were activated first and allowed them to move reinforcements into their end of the town. The French did move into their end of the town but now they would have to get involved in house to house fighting. 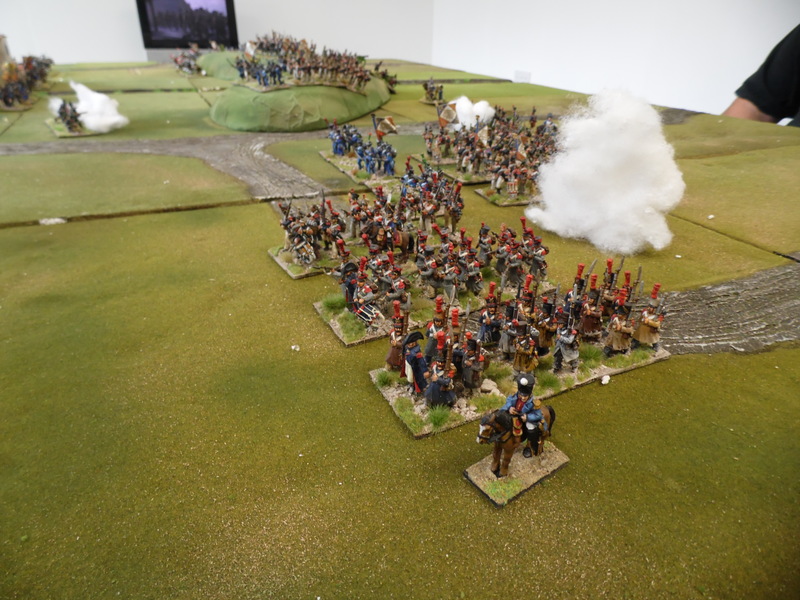 The British were not having a great day, their firing was not causing the casualties they hoped for and losing all faith they moved more and more units into the town. 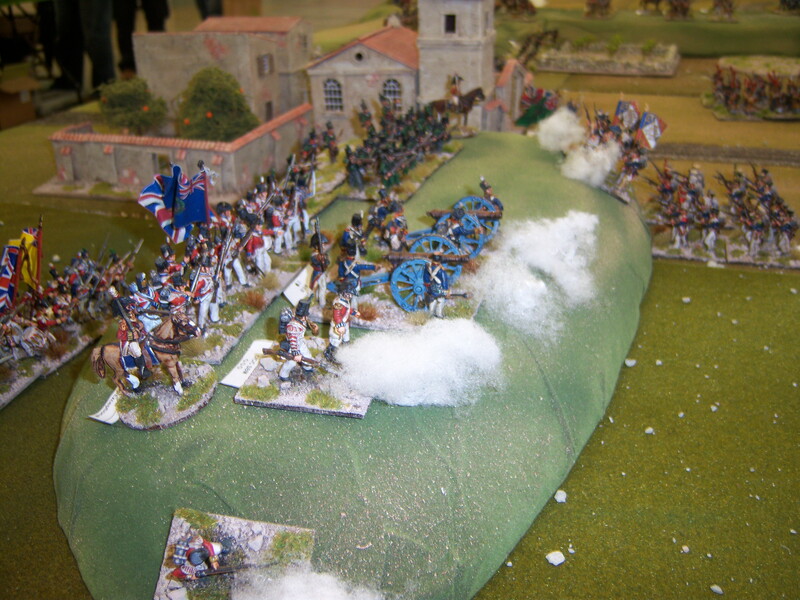 The French right flank came down off the hill to engage the British moving into the town. 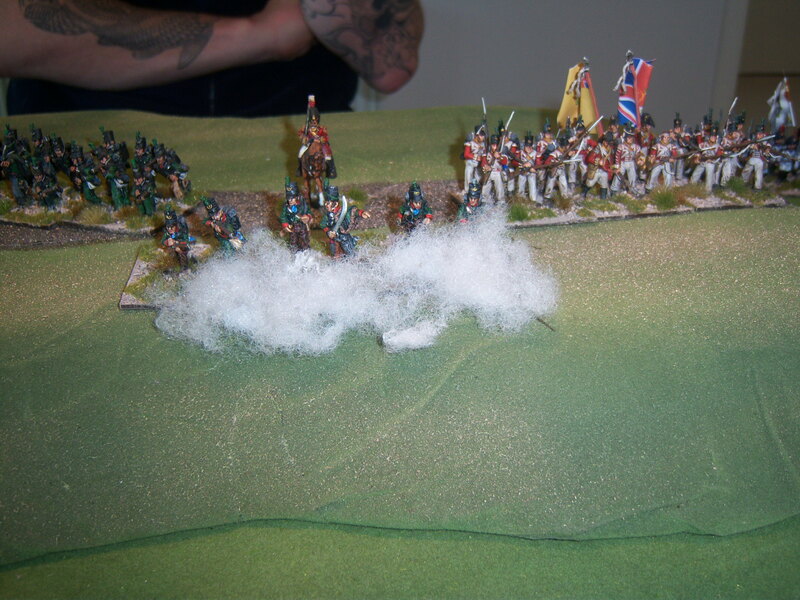 This advance was only halted by the late appearance of some British and Portuguese Light Dragoons to their flank. 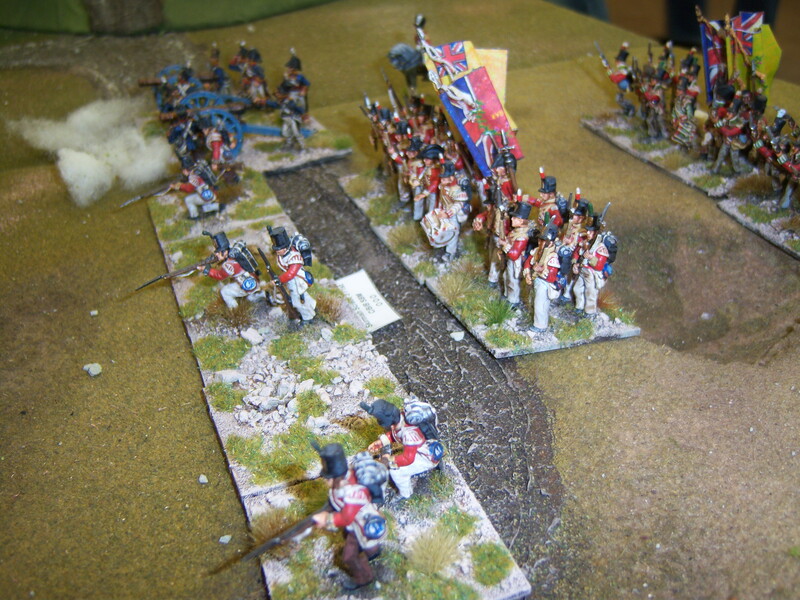 The Light Dragoons went in catching a French column in the flank. It did mange to hold though. This fear caused the remaining French units to all form square. I could almost feel the sense of Christmas coming early for the British artillery seeing this new dense target that surely even they could not miss. ( They had been rolling terrible dice). 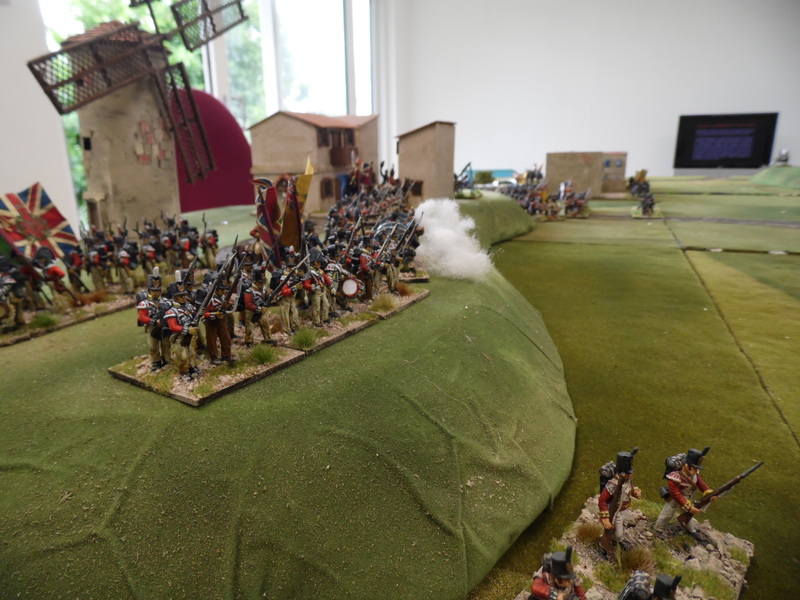 The panic in the British was also true on their right flank as they abandoned their position upon the french cavalry coming down the hill and raced for the town, leaving a few skirmishers to stem the on coming cavalry. 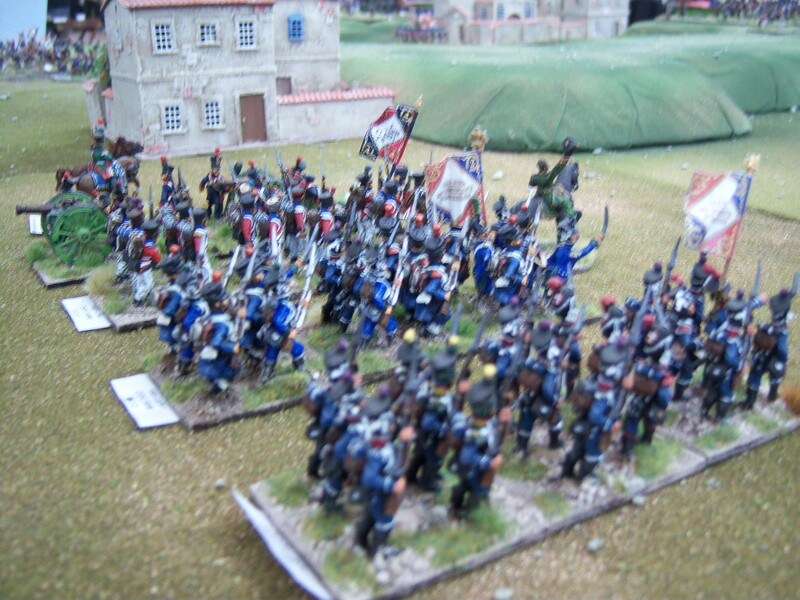 Last turn of the day heard the British give a sigh of relief as the Portuguese infantry finally turned up. 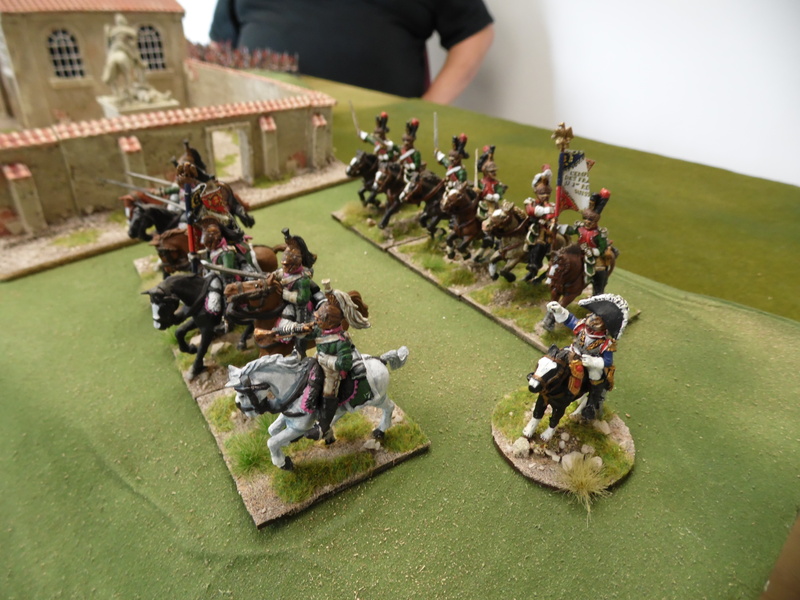 The French had their cavalry and Italian reinforcements also turn up. Everybody now have the confidence that they could win the day. In all we had about 5 hours of full on gaming with many breaks for tea and chatting and an hour or so for lunch. It was decided that we would leave the game as was and continue next month. So Part One is complete what can Part 2 hold? Will any more reinforcements turn up, will the squares hold, can the French clear the town or can the British clear it. 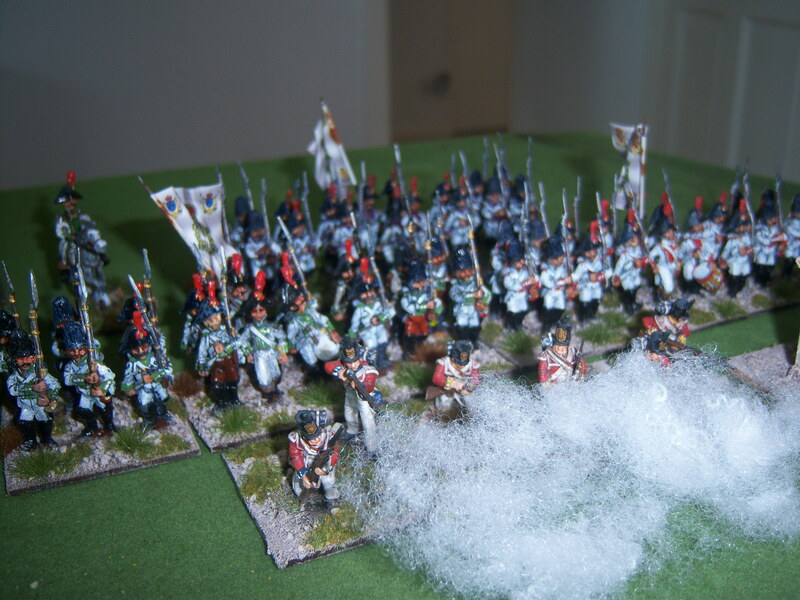 Figures and terrain are all from my collection, mainly Perry and Victrix with a few Elite. Town and trees were homemade. Rules – Our own house set called “King George Commands and We Obey”. See link to rules on side of page if interested. 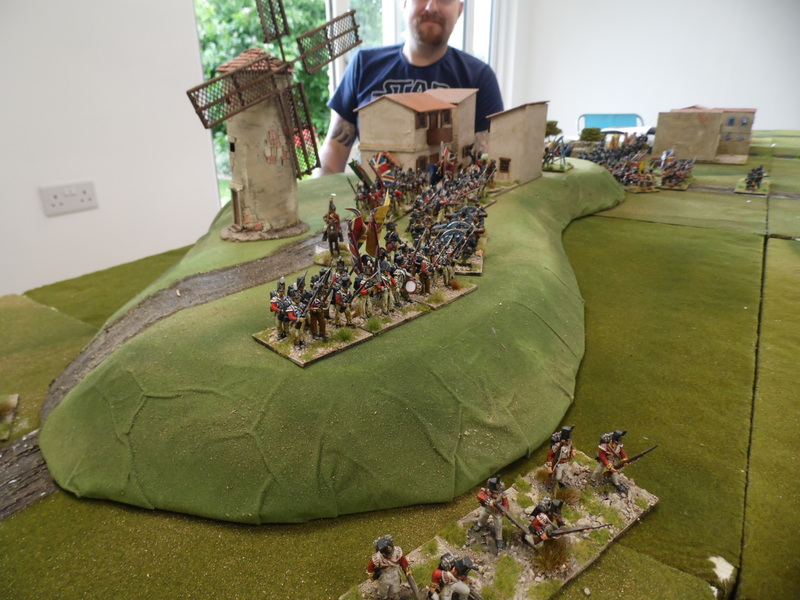 August’s Game – Like a lot of Brits we went to Spain. I had received a request for a Napoleonic game. 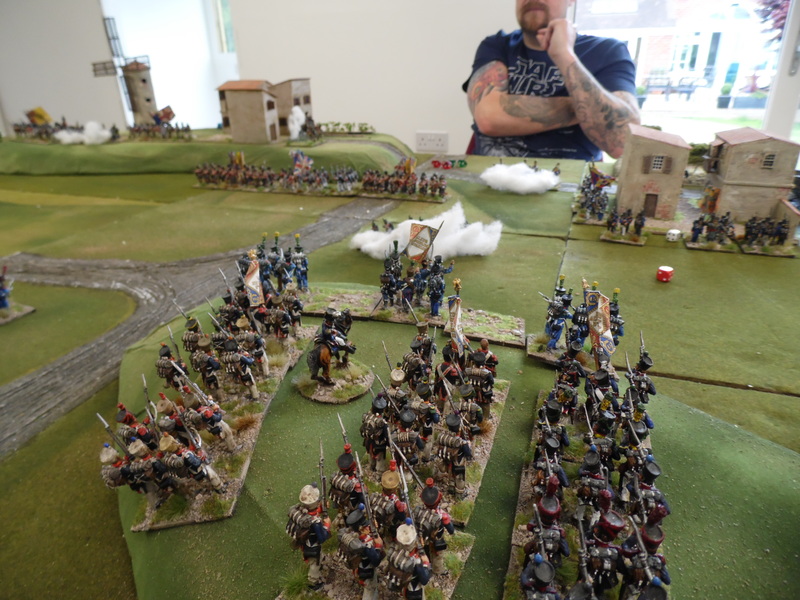 Steve had only played Napoleonics once before so I decided on an engagement battle with the British having the added task of trying to secure an point of entry. As was normal in the Peninsula, the British were outnumbered in cavalry but had their new secret weapon, Congreve Rockets! and hopefully the promised assistance of the local Spanish Commander, who assured the British he would be there as soon as he could. The terrain was laid out. The British were to come on from the main south road (A) with a small advance force having held the hill line. The French were able to come on along the whole length of their edge. Both flanks had been secured with cavalry although poor leader abilities may mean that the cavalry may not be as active as the French commander (Steve) may like. Our own set ” King George Commands And We Obey” KGCAWO. 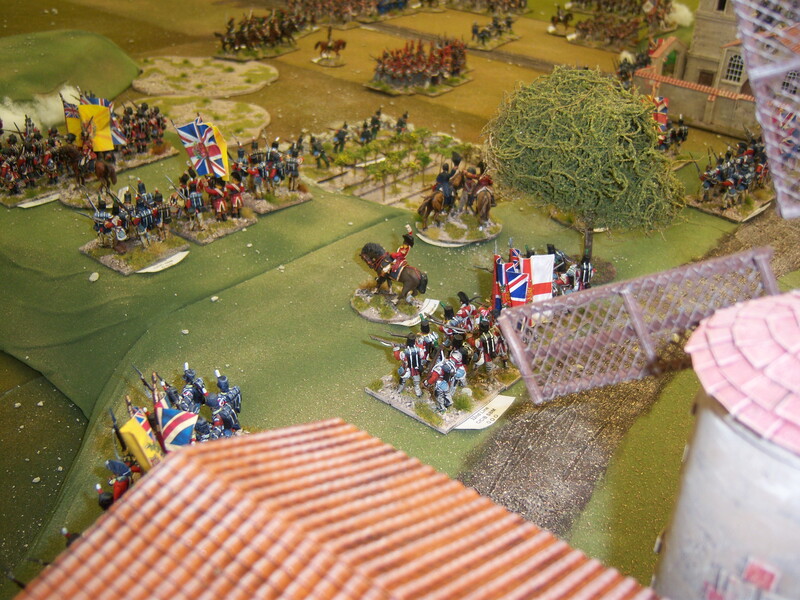 The French came on to the table in a confident manner securing both flanks. Their brigade of infantry that started on the far right flank began to advance upon an increasingly isolated British light dragoons, who patiently awaited the arrival of the Portuguese brigade. The Portuguese decided to support the Light dragoons by taking up residence in the village of Blanco Aqua which spanned the river. The French columns of Grenadiers, eager to get to grips with the British started to advance upon the brigade holding the hill line. 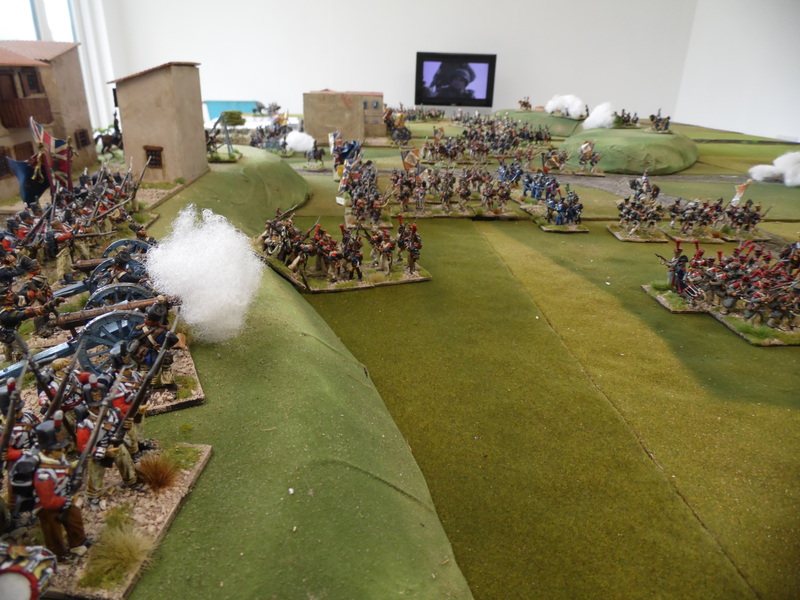 In fact they were so keen to engage they started to pull away from the rest of the French army. They had out-marched in particular the brigade next to them, who were in mixed order. The British gunners on the hill spotted them and switched to them as a target (No skirmish screen to protect). Worst still, although not sure for who they had drawn the attention of the rocket troop! With a mighty whoosh the rockets screamed into the air. Nathan’s dice throwing allowed the rocket to head on a straight path towards the target, at least for a while. Then, all of a sudden the rocket started to turn, back upon itself heading towards the foot gunners on the hill. Luckily for them the last die Nathan threw was a 1 and so the rocket came down just short of the crew, forcing them and another two British units the rocket had flown over to test. Luckily all survived unharmed but it did mean that once the laughing had finished the French commanded commented that it may be a lethal weapon on shaky troops, if only it would fly correctly. 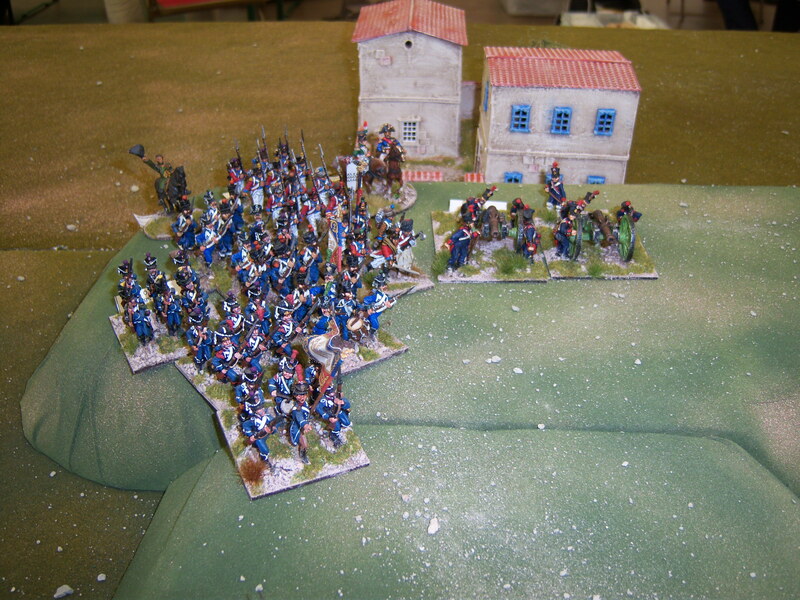 The French right wing cavalry engaged and destroyed the light dragoons but were driven off from getting closer to the village by some accurate fire from the Portuguese inside the village. It was at this time things were starting to get tense in the centre. 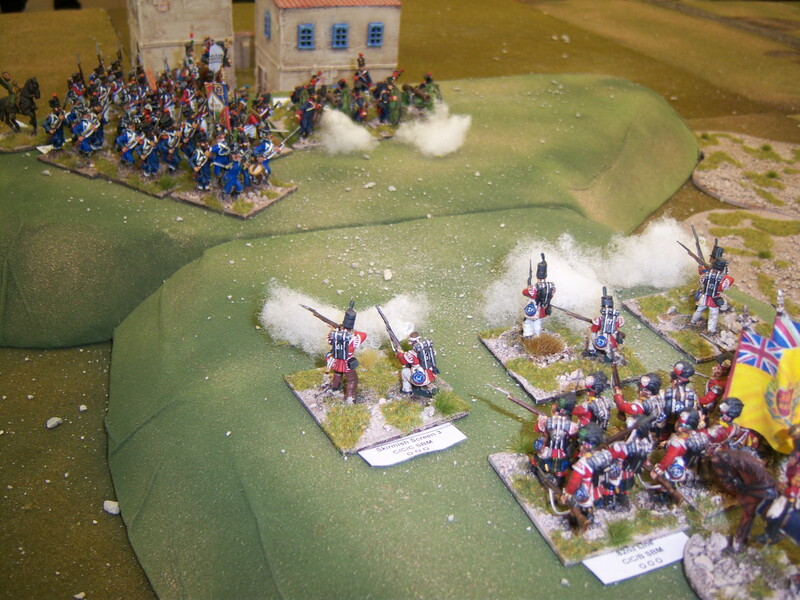 The French had been steadily advancing upon the British with minimal casualties. The deployed light regiments in front of the attack columns really paid off. This was not true from the French Grenadiers who had suffered terribly. 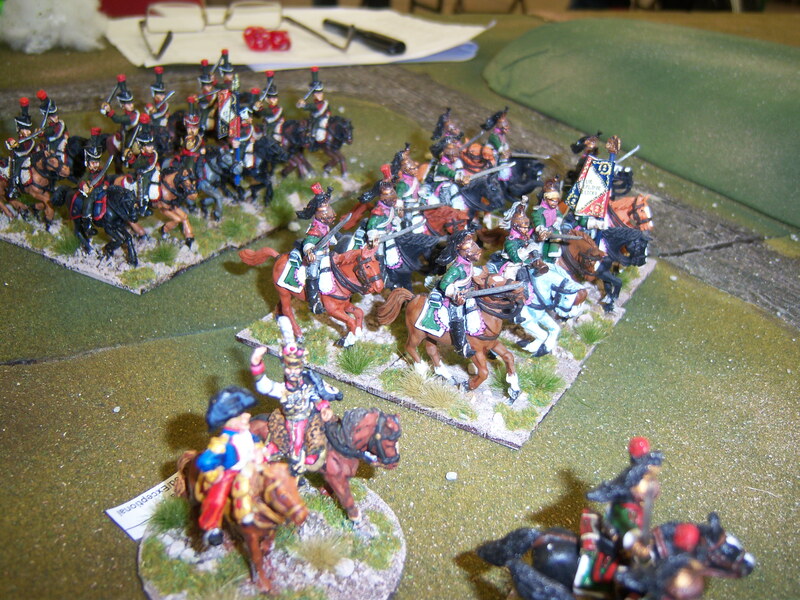 Luckily for hem the French left wing cavalry had managed to advance in support and this in turn had force the British heavy dragoons to retire and forced the end British line unit into square. The next turn a fate/ fortune card revealed a previously unknown ford in the river. Whoever’s action card was drawn next decided where they thought the ford was and on a 4-6 it was there. The next card out was French Light Cavalry Division, they identified the river area between the town and the hill and threw a 6. This allowed them to advance through the river and threaten the British centre! 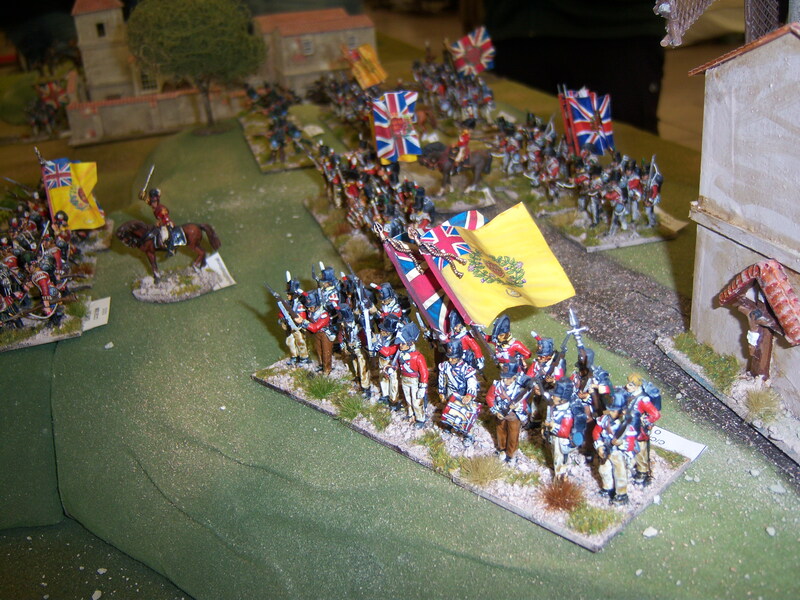 The French centre were in melee with their columns against Picton’s brigade. Only stout defending managing to save the day. 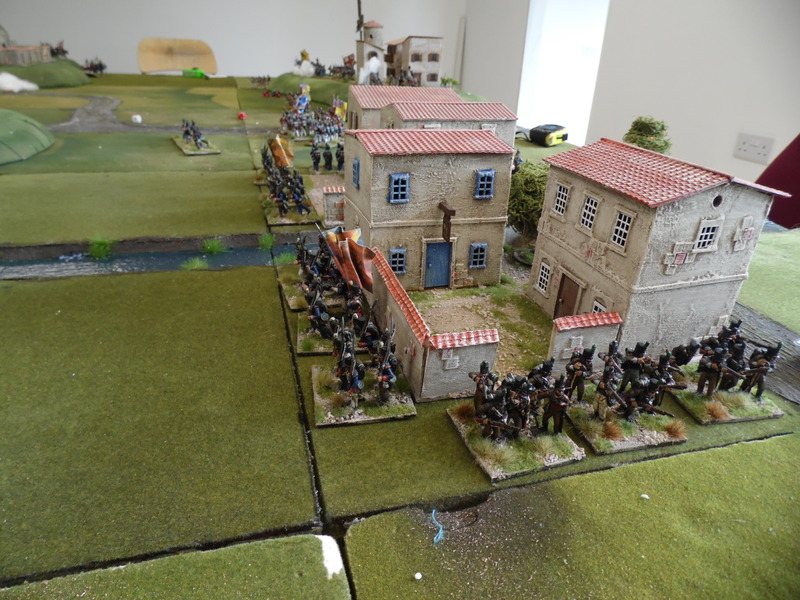 With the light cavalry ready to pick off the remaining British, accurate and timely fire from artillery and the Portuguese in the town convinced the cavalry they may have advanced too far. The Game was declared a British minor victory. What happened to the Spanish Commander. well he could arrive on any turn after the 8th turn. This came and went, as did the 9th, 10th and 11th. He never managed to get a way from his mistress in time to get to the battle! Time for our Saturday game. 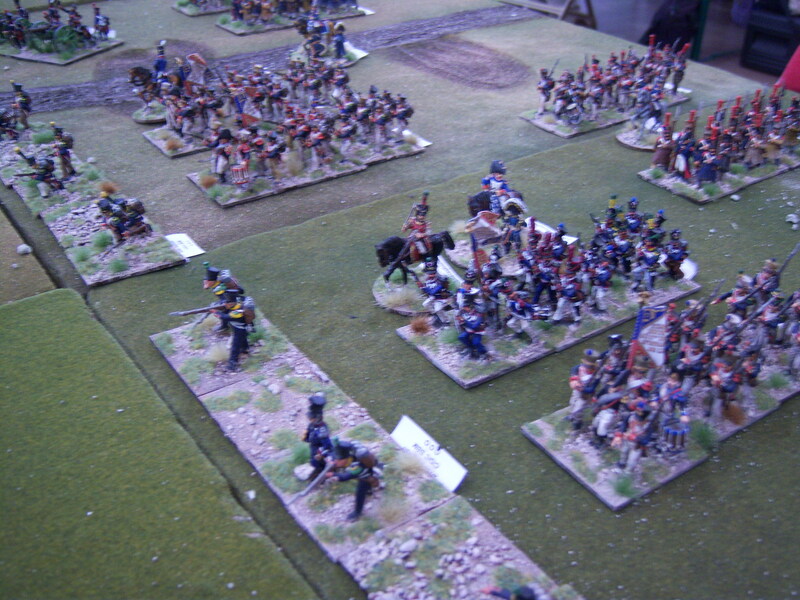 Nathan had never played Peninsula Napoleonics nor in fact 28mm. I decided to do a little scenario for him to get familiar with the troops and the rules. ( My own, King George Commands and We Obey). 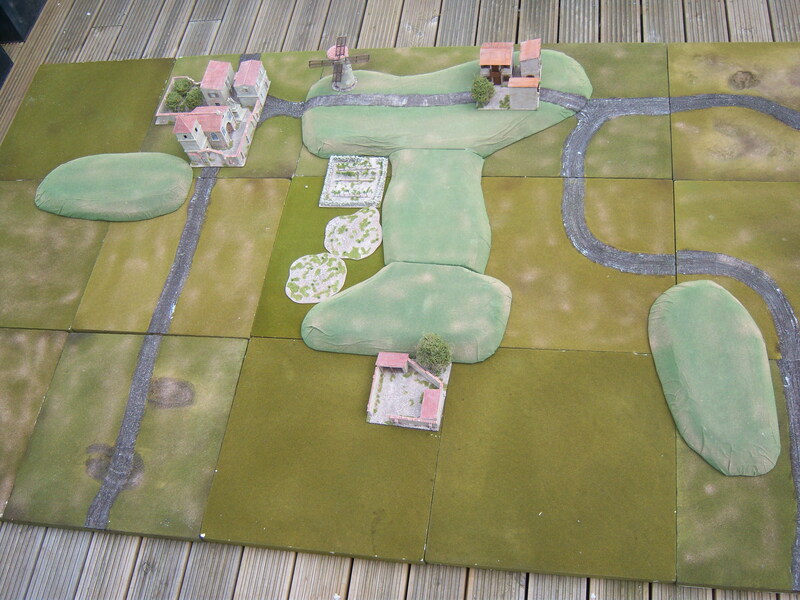 We had a 6×4 table with a village on each flank and a hill line that the Allies were defending . The French came on in the same old way with the right flank brigade (3) taking the village ahead of them with a plan to advance through it and the orchard to engage the Spanish, defeat them and turn the allies’ left flank. All this while the other infantry brigades advancing under a skirmisher screen take the hill line. 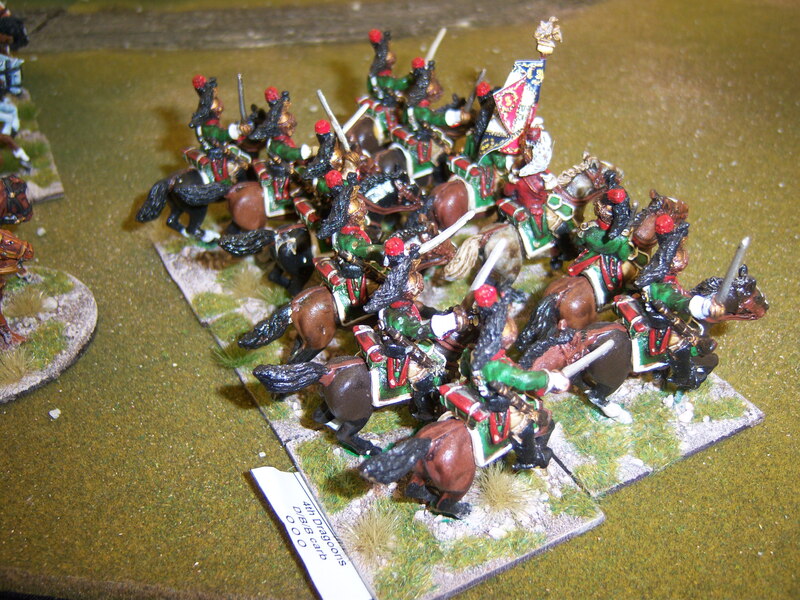 The French Dragoons there to exploit any gaps etc. Well that was the plan! All started well with both sides trading shots and no real damage. Turn 3 was a telling moment. The draw of activation cards did not go well for the French and the reality of a poor commander started to show. 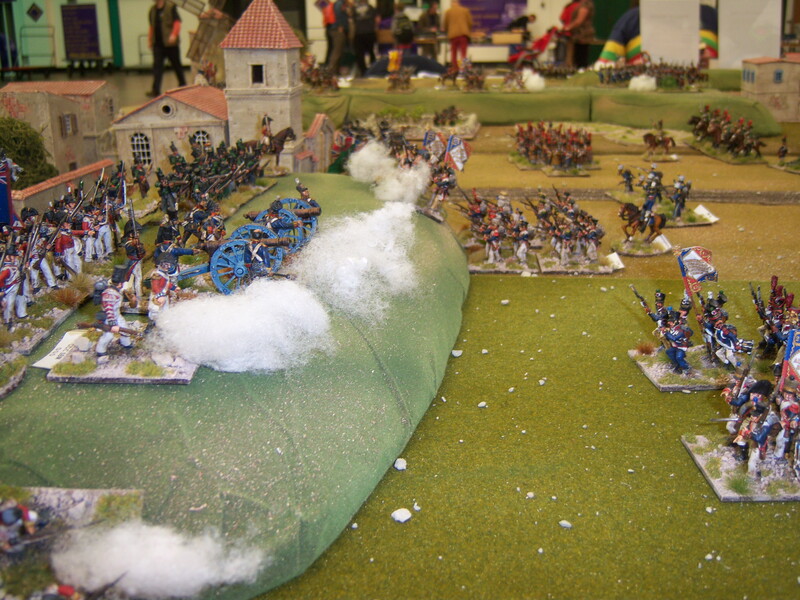 He was unable to influence the whole battle field, so the dragoons and brigade 3’s movement ground to a halt. This timed with some first class counter battery fire silenced the guns in Brigade 1 who were supporting the advancing brigade. The French centre starts to make it way up the slopes. 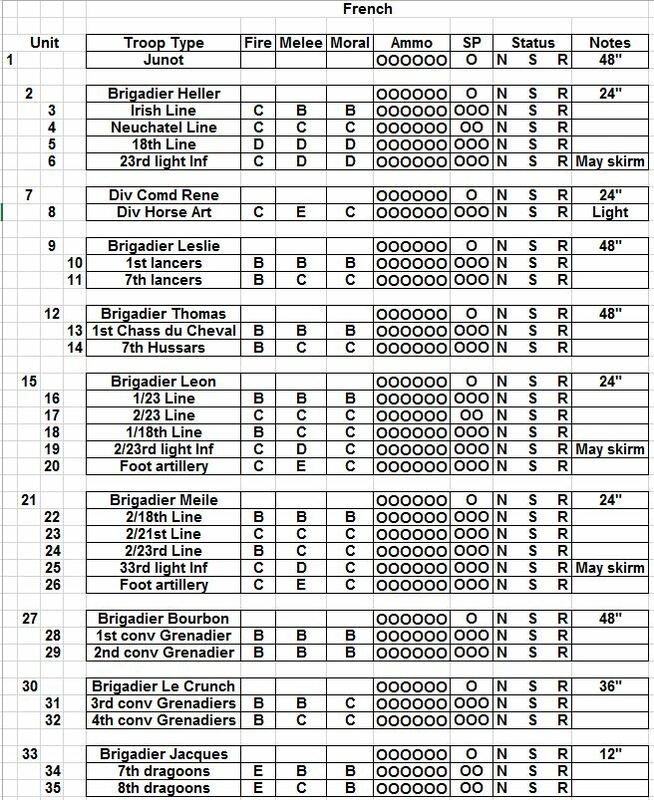 The Pathetic British cavalry advance forward and could potentially threaten the French units in brigade 1 who are in Attack column. Not to worry the Dragoons will ride them down! Turn 6 was the defining turn! The second activation card was the Fate Fortune card. The result was master spy in play. Nathan won and so he looked at the next 6 cards and rearranged them to an order of play he wished. This allowed all his brigades to fire with devastating effect and his cavalry to charge into the side of my attack columns. The six card being end of turn, therefore my French never got to move. Over the next three turns his unit of cavalry dispatched two columns who all failed to react and form square or inflict any damage. 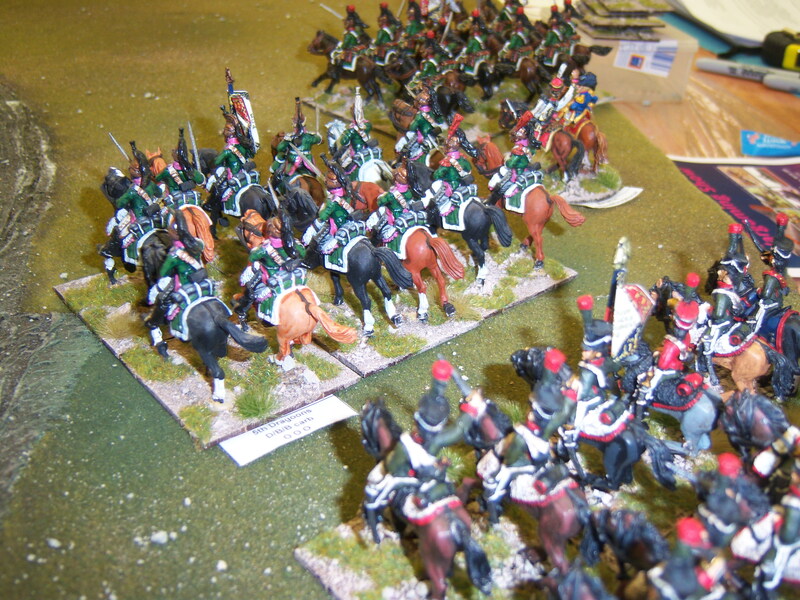 Too late I did manage to activate my dragoons to charge into the rear of the British cavalry, getting rid of them. My centre in ruins, a strong British presence still on the ridge and slow moving French Allies through the town we called it a day and a British Victory. Here are a few pictures from the game and latest version of the rules. 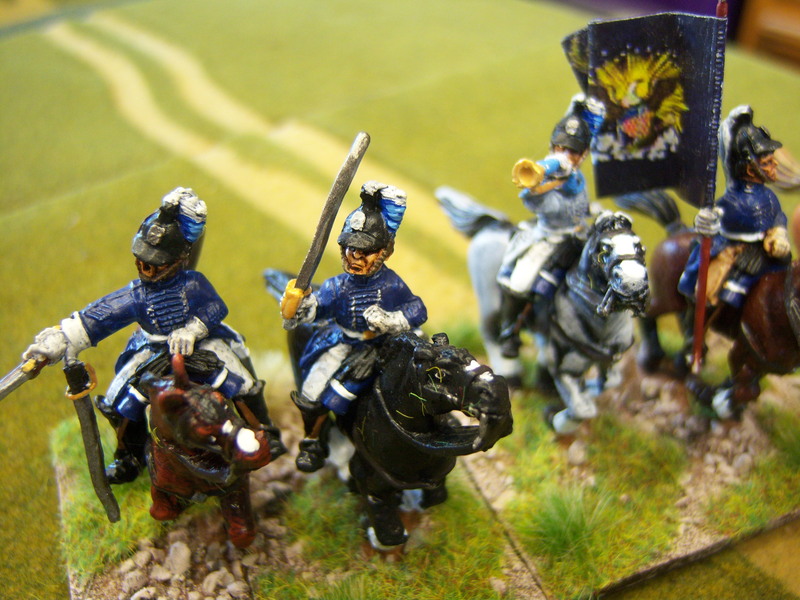 French dragoons save what is left of the day! 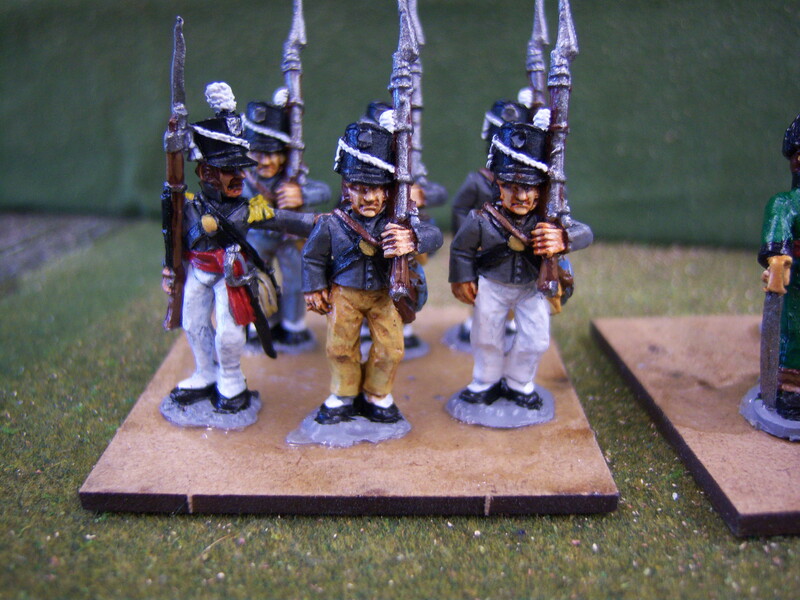 Over the last week I finished off the 2nd unit for my new Old Glory 1812 Armies. I intend to build my units around the battle of Crysler’s Farm. The flag is speculative and is a reduced sized infantry flag. Nice figures although the officer may be considered a little too enthusiastic waving sword in one hand and helmet in other. Maybe a past relative of Rooster Cogburn! In the Rules, KGCAWO they will have the following unit characteristics for Crysler’s Farm scenario. 2nd US Light Dragoon D/C/C Carbine. Only one troop, so starts game with 1 Strength point. Uniform Details There are a number of variations shown but I have opted for the most common version. Helmet – Black casket style helmet with white horse hair crest with a white over light blue plume and silver plate. Saddlecloth Blue edged white for the men and silver for the officer. Musician – coat with collar and cuffs, all grey. Otherwise as the rest of the unit. A bit of a late blog but with getting the game ready for Legionary I have let the update slip. Ten days to the day from placing the order, over 25kgs of metal arrived. I also ordered a few packs to bolster my Scottish Wars of Independence armies. These will bulk out my schiltrons which are currently made up of EBOB and early Citadel/Ral Partha miniatures. 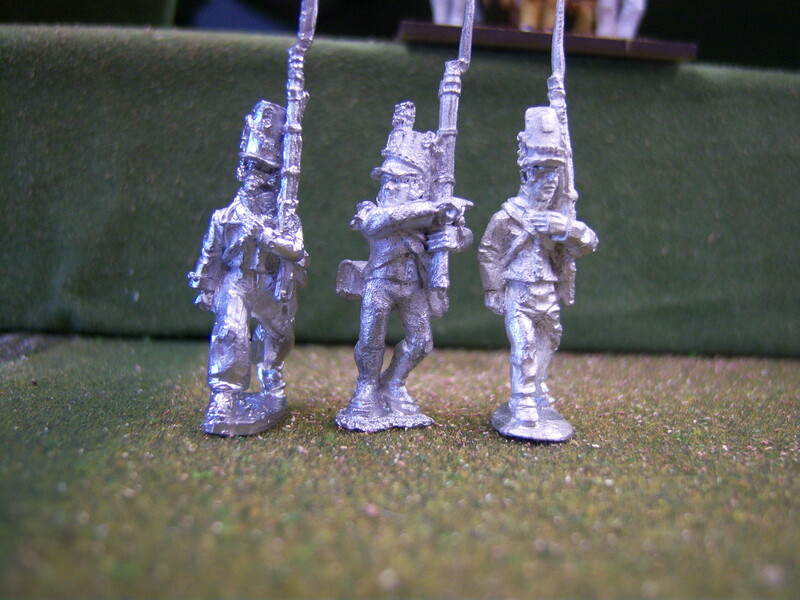 I must say that I am very impressed with the 1812 figures, have not opened any Scottish War of Independence packs yet. The pose variations and detail is great. From the packs I have opened there seems to be about 5 poses on average, excluding command if included. Then each pose will also have a number of head variations. While unpacking, I discovered the British rockets crews and I had to open, prime and start painting. These are very animated and I just love the faces. I will finish the rockets in the next couple of weeks hopefully, so will update when they are all based. 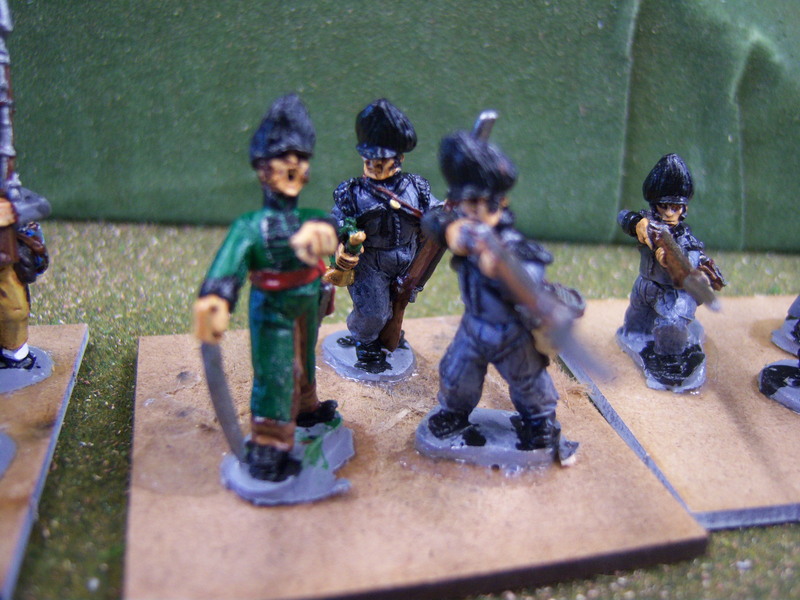 I also started to paint some of the Canadian Voltigeurs. With there being 30 in a pack and using my KGCAWO rules they will only fight in a skirmish formation. Therefore I can get 3 figures to a base and have 5 bases to a unit. Here are the first couple of bases. Here is a picture of old glory compared against the foundry 1812 range and Knuckle Duster. I think old glory and knuckle duster are fully interchangeable. Foundry are a little smoother in style than the angled edges of Old Glory and Knuckleduster but all have great facial detail. Foundry are smaller and slimmer but I suppose the old figure intermingled would not matter or you could have whole units of them. The only issue with that is the lack of pose variation. Here is a picture of some foundry painted. 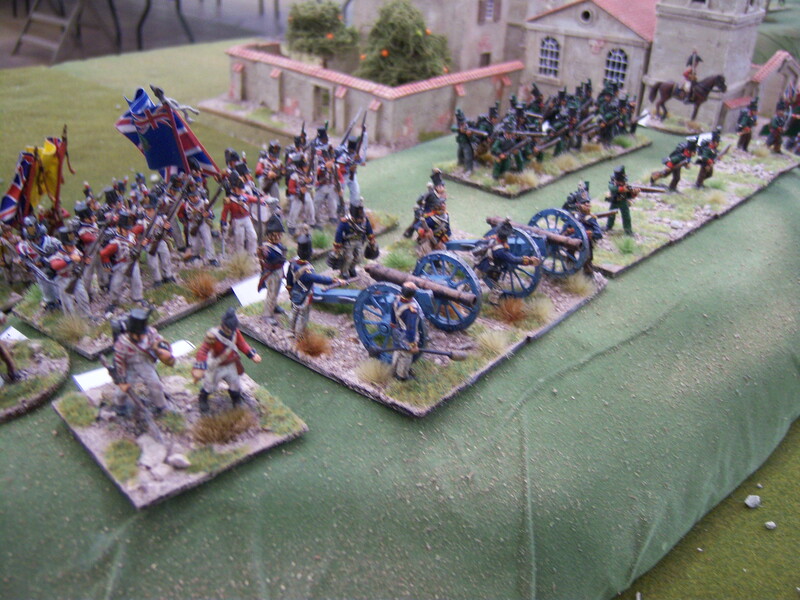 Foundry American War of 1812 range. 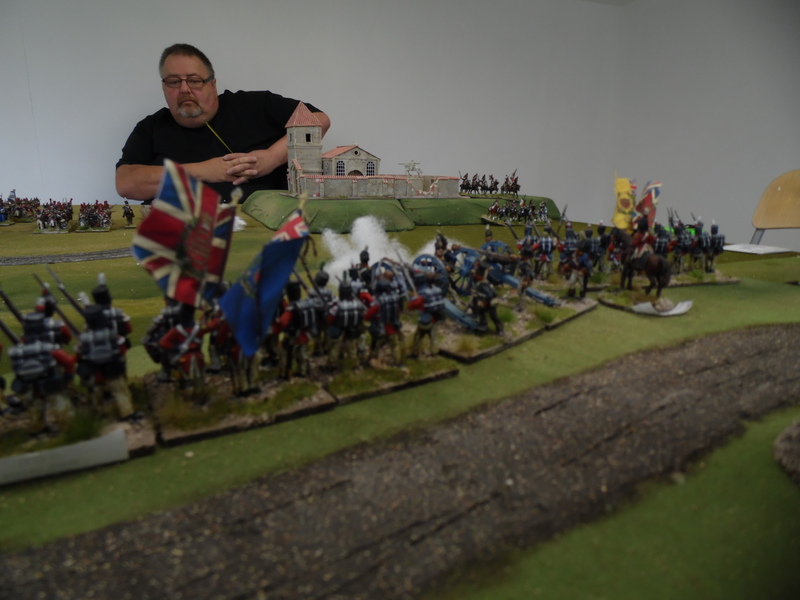 I guess that next years demo game for Legionary 15 will be the War of 1812 and probably Crysler’s Farm. What a manic Friday, the show was on the Saturday. I started by laying the terrain out on the decking to get a view of the 12 x 6 table. Then I packed it all away ready for the next day. Legionary is a great local show. How many other shows can you drive to within a couple of feet of your table. We drove in and unpacked and set up. Thomiere and Charlot’s troops in column with skirmishers deployed. In the background you can see Kellermans reserve Grenadiers. Just out of shot are St Clair’s Grenadiers. In the background you can see Junot and the Army Guns. British Centre – Troops hold the hill. Holding on to the high ground just out side Vimeiro. 95th formed up in the background. 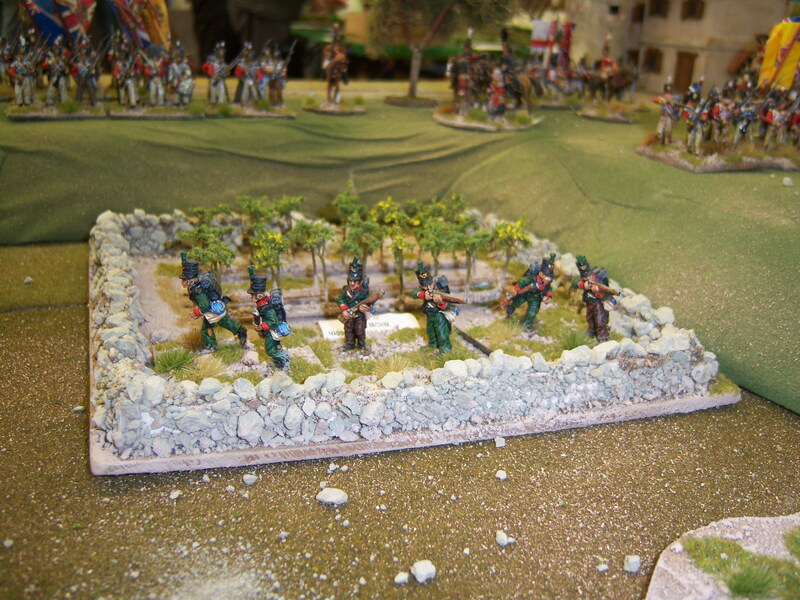 20th Light Dragoons shelter in the gap between Vimeiro and the ridge. What follows is hopefully an account of the game. The card drawn is identified and anything significant that happened! 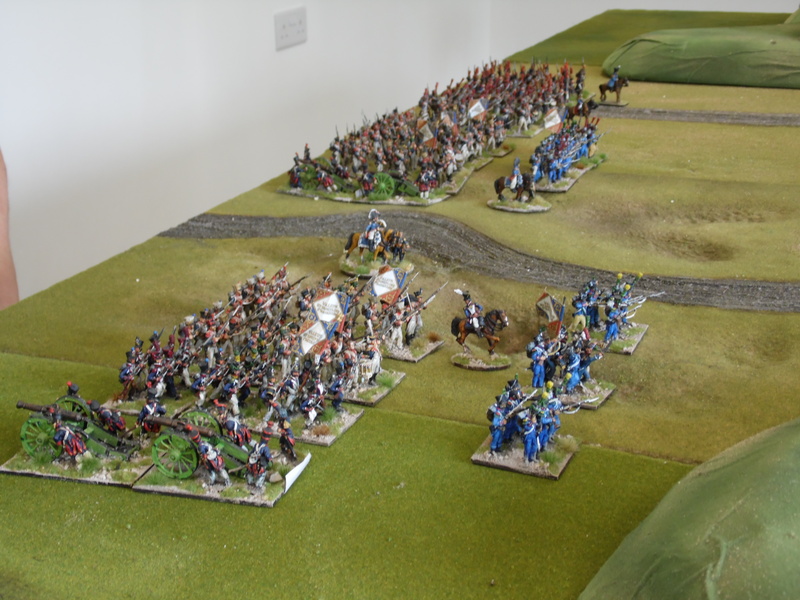 St Clair – General advance skirmishers 8″ and columns 6″ towards Fane on the hill. French Army gun – fire at the British artillery on the far right (Anstruther) they C class (5) with die modifiers +1 First shot, -1 Long range 38″, -1 smoothbore and -1 Target artillery. These meant they needed a 7+ to hit. they rolled a 1,2 and a 6. Sadly no hits. British started to mock the French gunners offering their grannies to show them how to do it! Smoke is placed in front of guns, not just to enhance the visual but to remind us they have lost the 1st fire bonus. this is removed either as an action or reload card drawn. 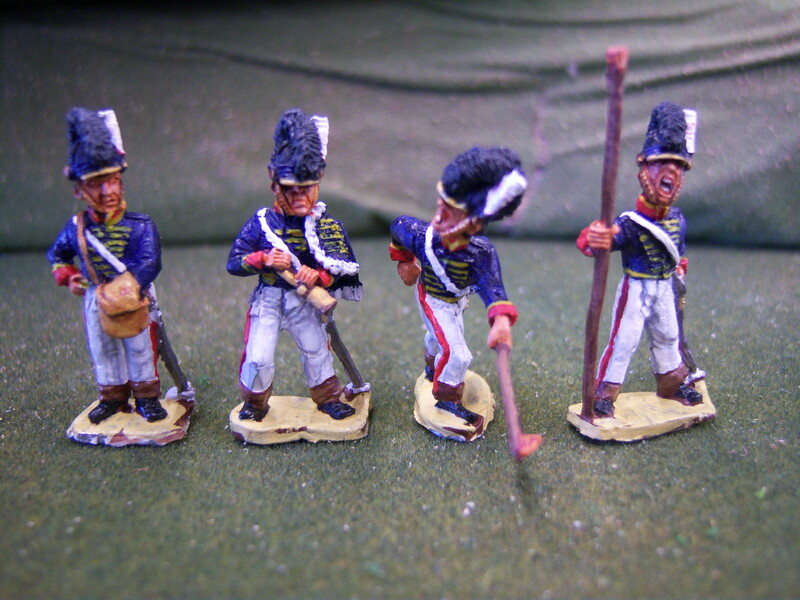 Kellerman– General advance skirmishers 8″ and columns 6″ towards Fane/Anstruther on the hill. Nightingale – Advanced down the spine of the hill to hold the high ground. Delaborde – He actions Thomiere who advances across the table. 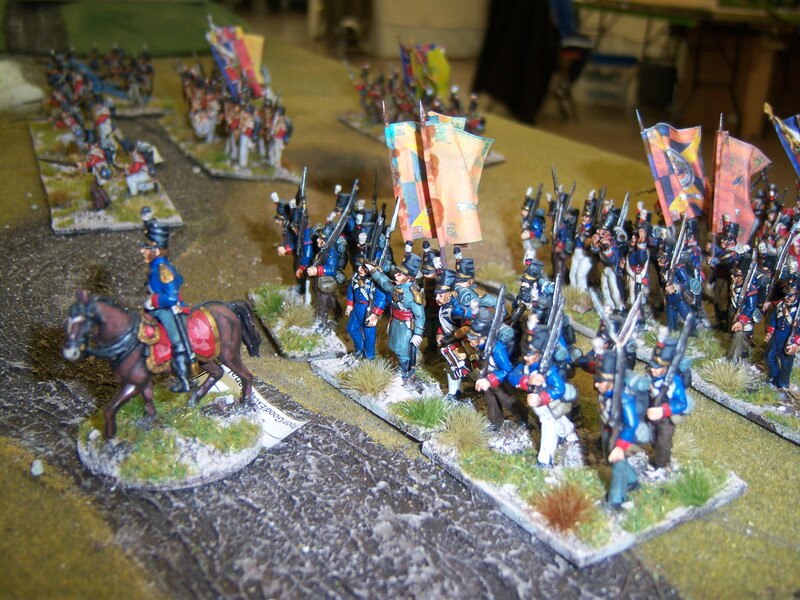 Bowes – advances and secure the left flank of Nightingale’s advance. Junot – With his 24″ command range and line of sight he actions Charlot, Thomiere, St Clair, Kellerman who all advance. For some the second activation of the turn. 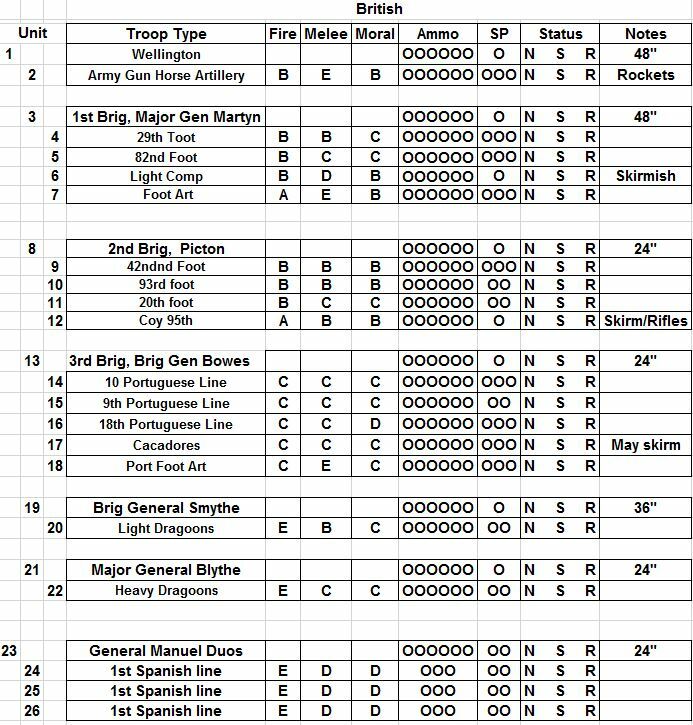 The Army gun get to fire again needing an 8 due to having already fired therefore losing the 1st fire bonus. They roll 1,4 and 8 so 1 hit. this is not saved but the British pass their morale and do not go shaken. French taunt the British about their Grannies turning up! Junot cannot action Solignac as Toledo is blocking site and distance is too far. Deployment is all about command. Fate/Fortune – 2D6 rolled one tens the other units. 24 rolled. This resulted in the next divisional or brigade commander ignoring their direct commander as they can do better. Both side understood the impact the card could have. Charlot – General advance there were now within 12″ of the British right flank. But they now ignore any orders from Loison. 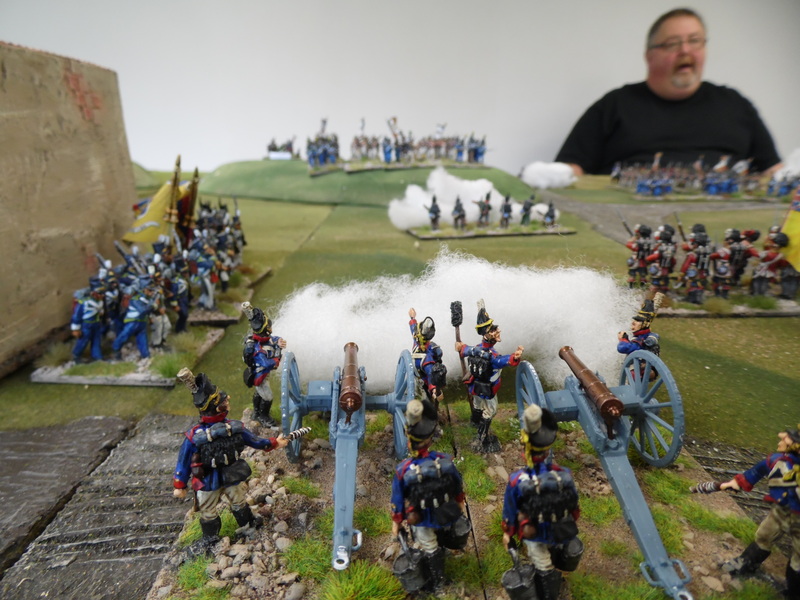 Anstruther – Unleash fire on the skirmishers of Charlot from skirmishers and canister from the gun. Skirmishers take 2 hits and fail to save either. They do pass their morale though. 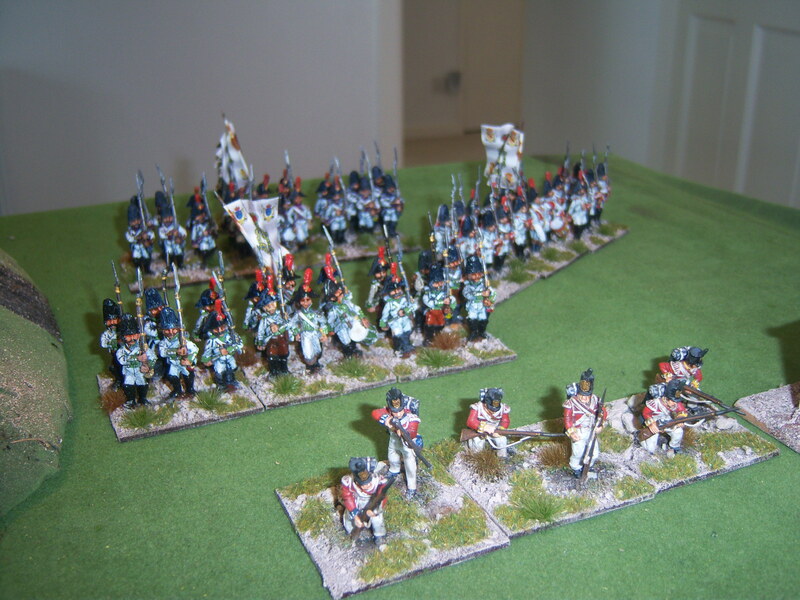 20th L. Dragoons – These advance cautiously to the front of the hill level with Vimeiro. End of Turn – card drawn. All cards return to pack and shuffled. 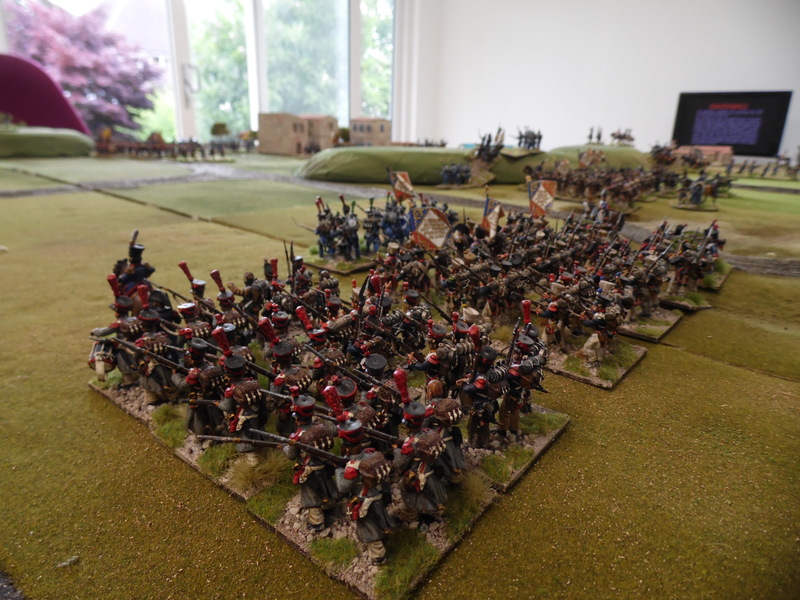 Kellerman – advance but concerned about the 20th Light Dragoons? Would they make it if their card is drawn? Delaborde – Activated Thomiere and brings Brennier on to the table. Solignac – Starts to advance up the hill into the face of Nightingale. Wellesley – from his vantage point on the hill and a 48″ command range, he activates, Fane, Ackland, Nightingale and Bowes with Anstruther and Ferguson out of range. Solignac’s columns take a few hits. It is easier to hit those columns. Margaron – these advance on to the table. Fane – they fire at the skirmishers and wipe them out. Loison – Charlot ignores him so he orders Solignac up the hill and on towards Nightingale. 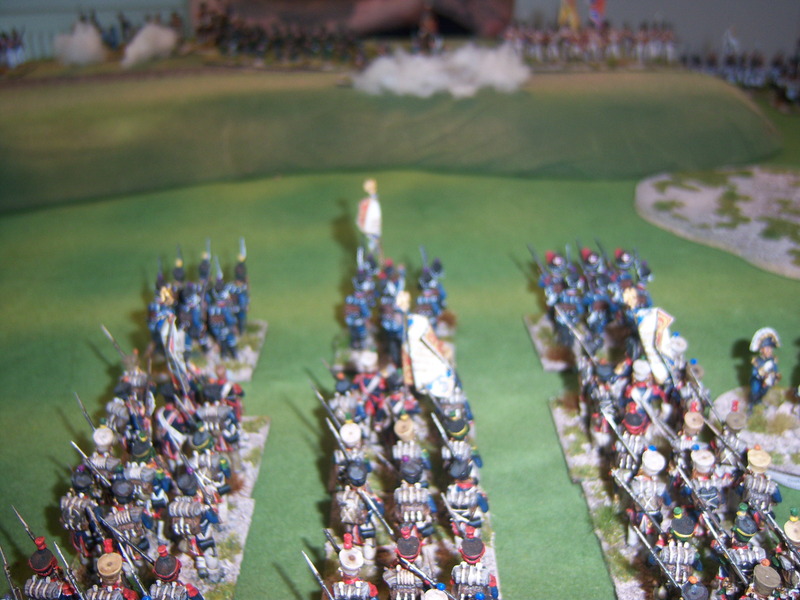 Ackland – 95th skirmishers advance into the vineyard and secure the boundary. 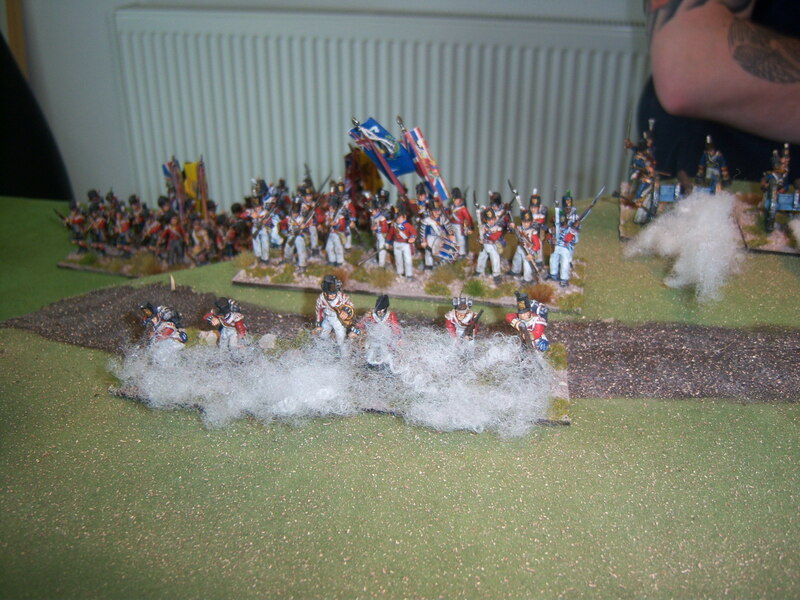 Charlot – Skirmish screen attempt to charge the artillery of Anstruther. Big mistake. Crew decide to stand and fire. They roll 3 D6 and score 1,1,2 so fire at a range of 4″. Charge range was 8″ so they can. Canister wipes them out. Bowes – Expresses concern over the appearance of Margaron. Anstruther – all open fire and inflict a few hits on the columns of Charlot. Nightingale – Advances down the spine towards Solignac’s advancing columns. 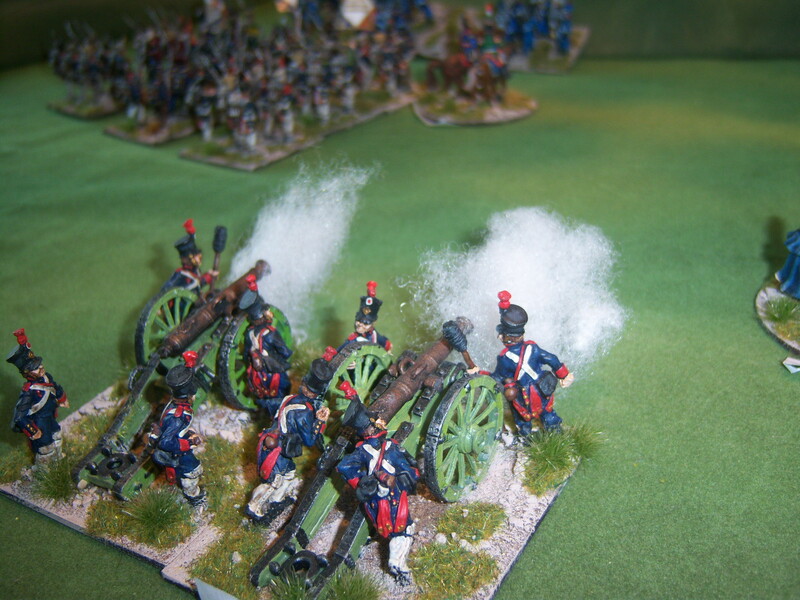 Ferguson – Artillery fire at Margaron inflicting 1 casualty on the 4th Dragoons, who fail their morale. Fanes skirmishers having retired through the 95th allow them to open fire on the columns getting a little too close. 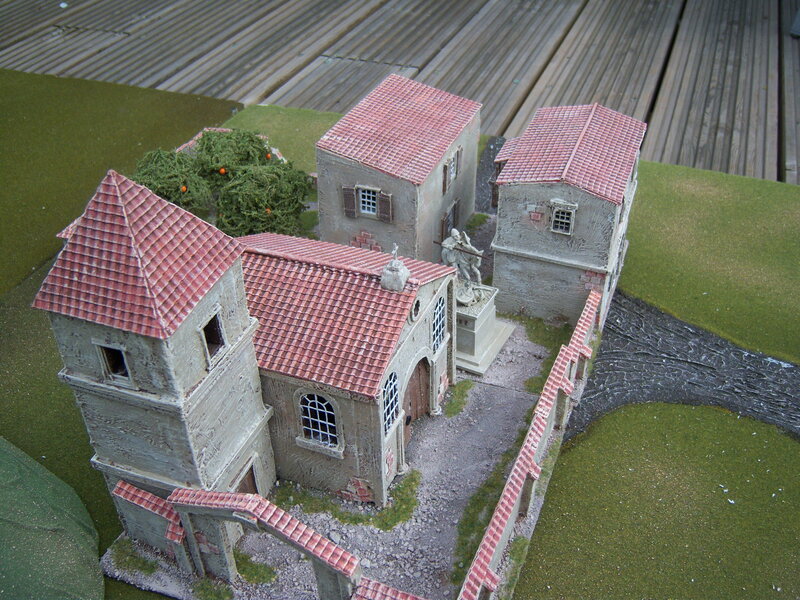 Anstruther’s second activation allows them to fire on the advancing columns. 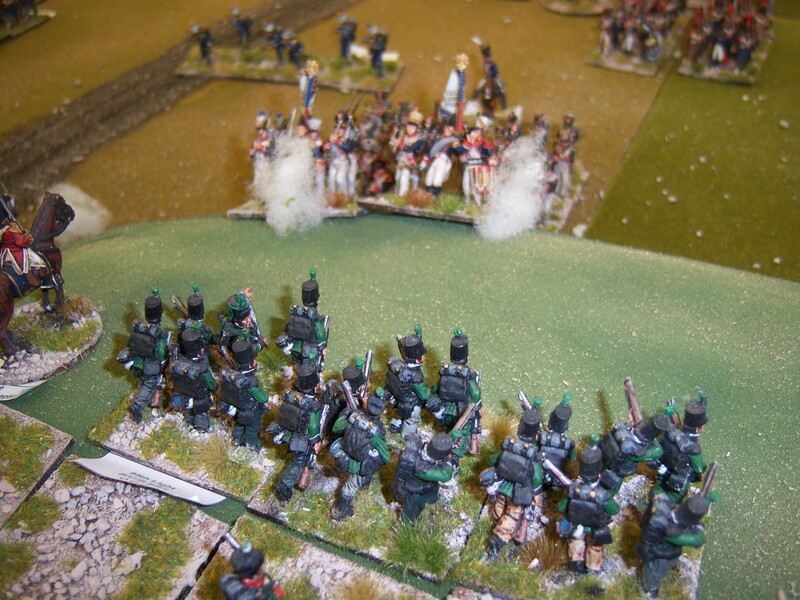 Wellesley – Charges the 20th light dragoons towards Kellerman’s Grenadiers. Grenadiers attempt to form square. 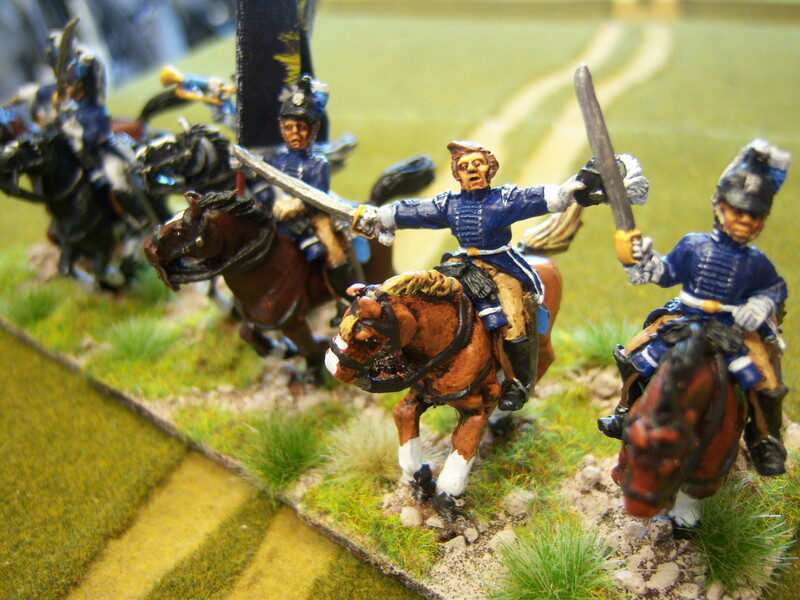 They have enough time as cavalry are more than 6″ away. they roll morale and pass. They form square. 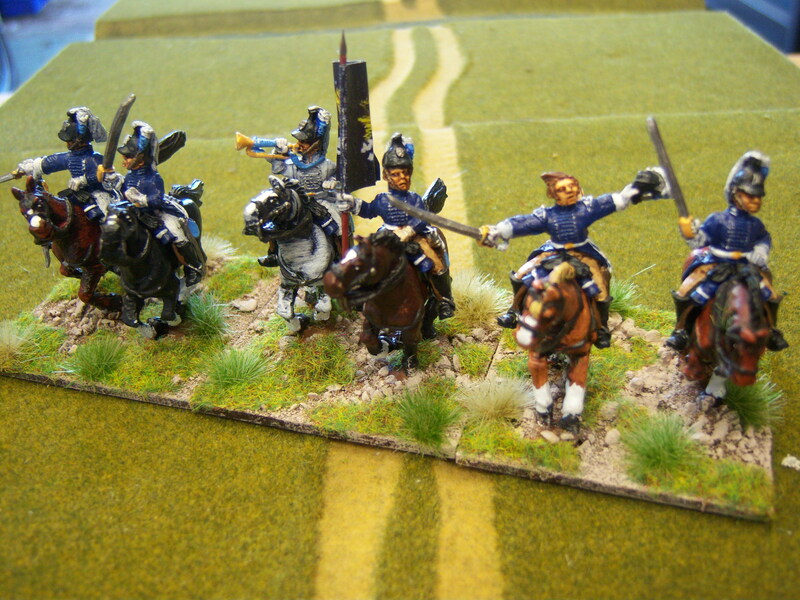 Cavalry are moved 12″ and end up 2″ short. A lax moment for Wellesley. Nightingale – Open fire on the advancing columns and cause enough casualties to remove a column. 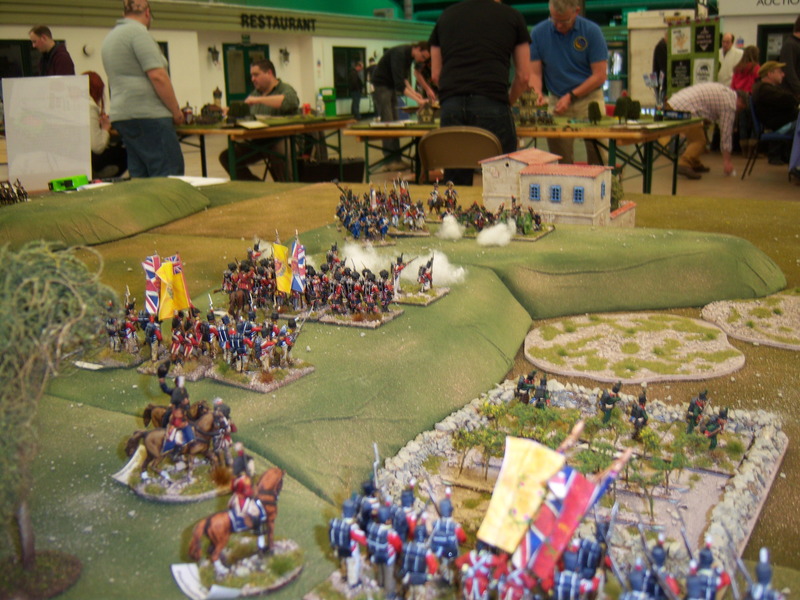 Crauford – Portuguese arrive on the table. They reinforce the left flank next to Ferguson. 95th unleash a devastating volley into the advancing columns. Charlot – pushing on to the guns with his columns and no skirmish protection. 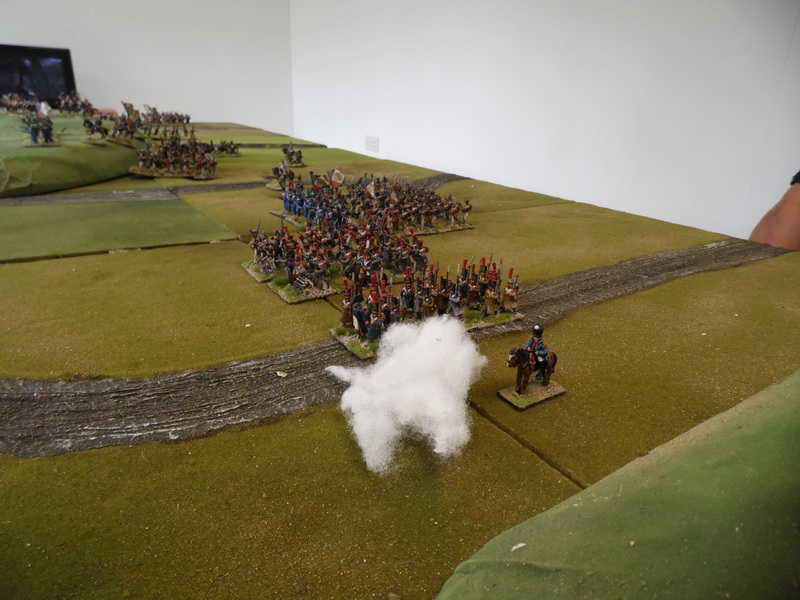 Ferguson – opens fire on Margaron again with little effect. 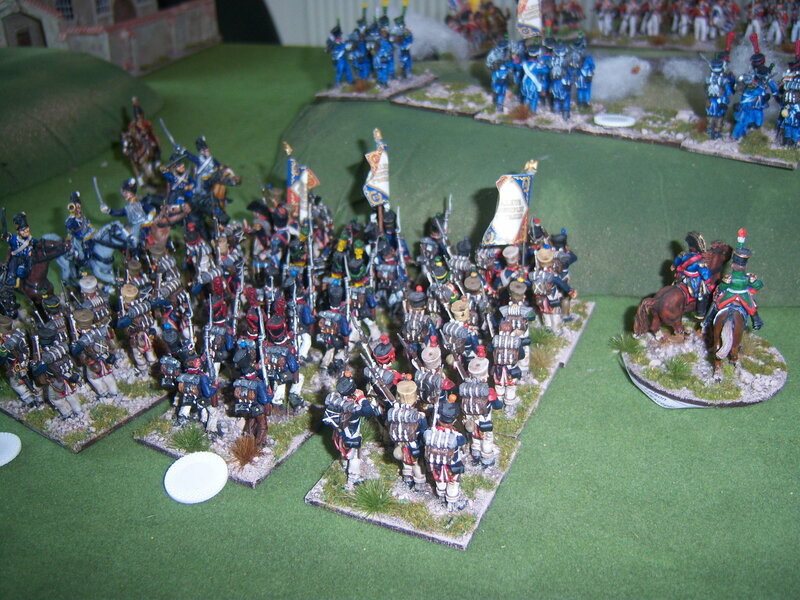 Solignac – opens fire and clears Nightingale’s skirmishers. Bowes – reinforces the gap between Ferguson and the advancing Nightingale. British left flank opening up on Margaron. 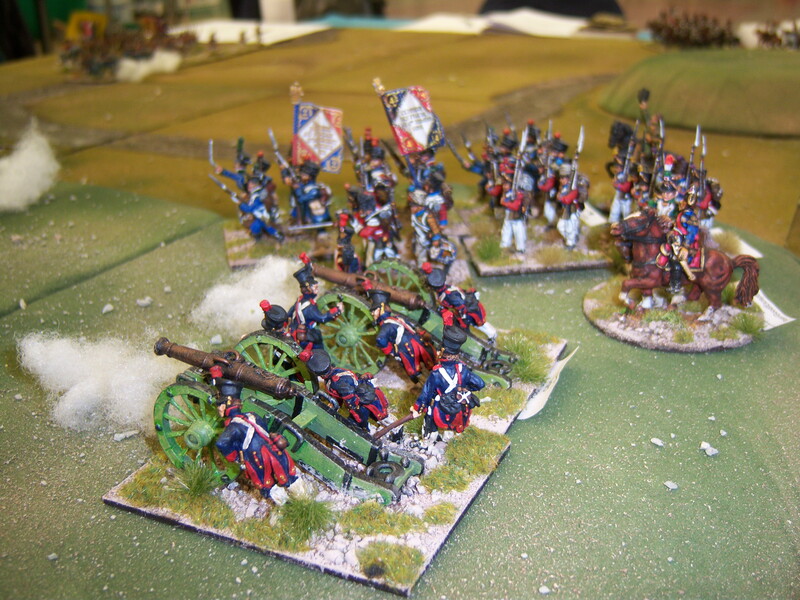 Solignac’s artillery fire on Nightingale causing casualties on his skirmishers. Nightingale – inflicts a few more casualties on the columns who now fail there more and grind to a halt unable to charge in. 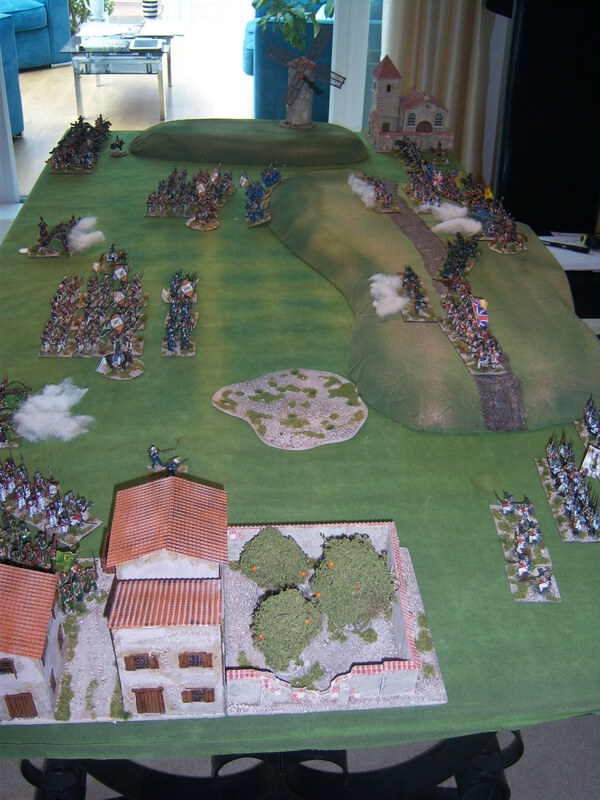 Delaborde – Activates Thomiere and his columns chare into the 95th of Fane. In the following melee 95th take a casualty but the column receive 2 saving none they are removed. 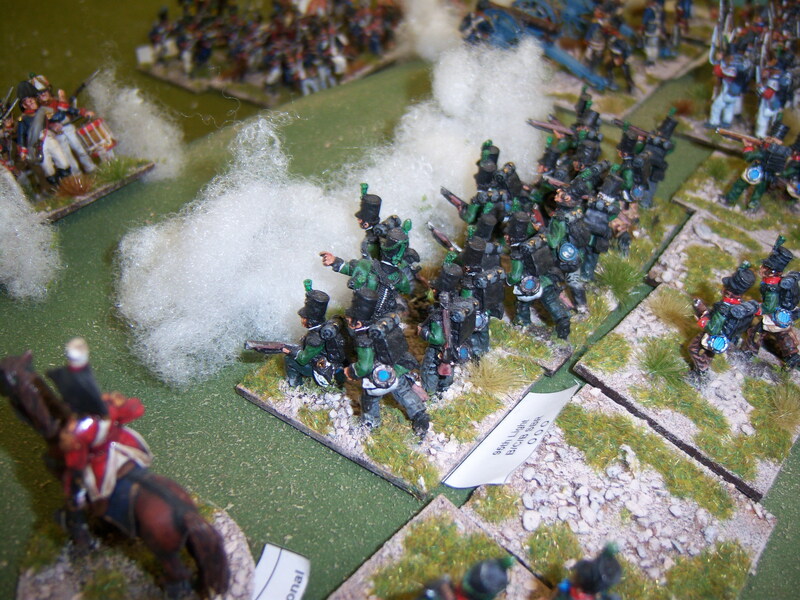 Kellerman – Grenadiers stay in square but fire on 20th L. dragoons inflicting a hit which is not saved. Following morale check causes 20th to become shaken. French cheer. Fate/Fortune – 11 rolled. commander sees the light! Anstruther – I thought I heard the French commander let out a sigh. Anstruther, already in a strong position has his command increased to exceptional. Cannon fire and take another casualty off a column. Junot – activates all commanders in the centre in one last charge. All units shaken test morale and all recover. the British player takes a deep swallow. 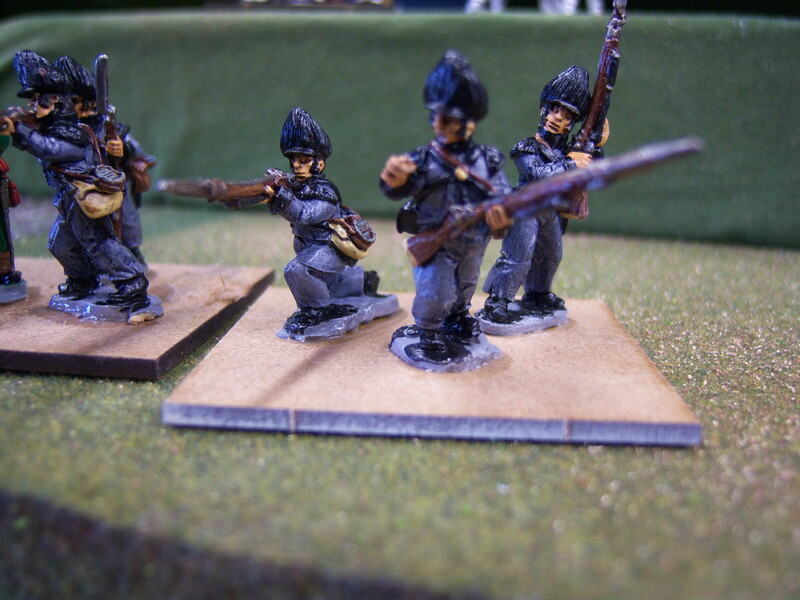 Brennier – tries to gee up his infantry following having been just activated by Junot. St Clair – Grenadiers get in and engage with the 97th inflicting 1 casualty without receiving any. 97th pass morale and hold. Fane – 95th engage with remaining column. They receive a casualty but inflict one as well. The column is removed and the 95th are on the edge. they have only 1 strength point left. Charlot – Engages cannon and takes them. Too week to do any more serious damage the French player concedes the day. 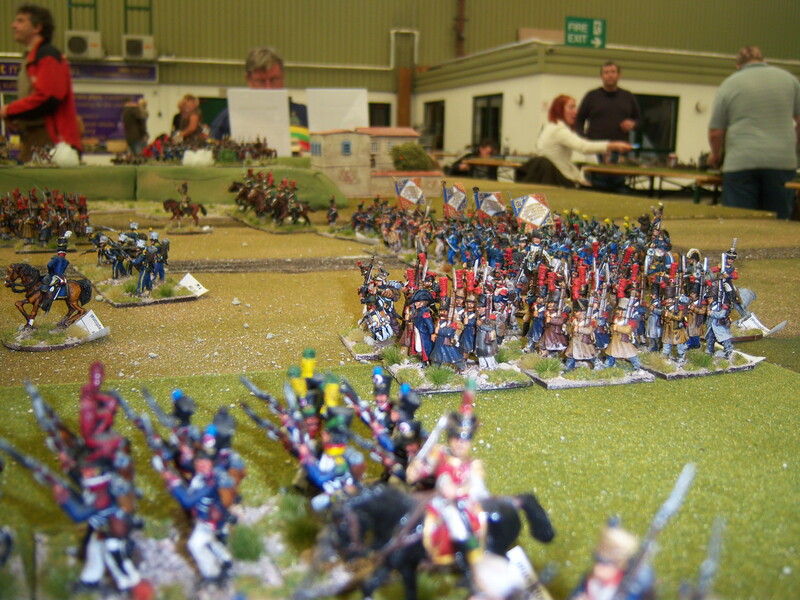 the British player very happy to accept as a few of his units are near breaking point. All agreed it had been a good day and the rules worked well, although they were still unsure about units not being able to be activated. I proposed that when the end of turn card is drawn, all units not activated can fire but may not move or change formation. Units can still not be rallied unless activated. I will amend some of the fate rolls to represent artillery with incorrect ammo. This would help with issues like the artillery at Bunker hill etc. They like the speed units can get engaged rather than playing for a few hours before getting into contact and really got to understand the importance of commanders being in the right places. they all agreed that the fate card is great as it can add a twist in the tail to any great plan. This was the first time both players had used them or played this era. Due to the ease of play and speed of play we had plenty of time to go shopping. if you get the chance please give Legionary a go. Great traders, easy parking (free), friendly organisers and a good selection of games. 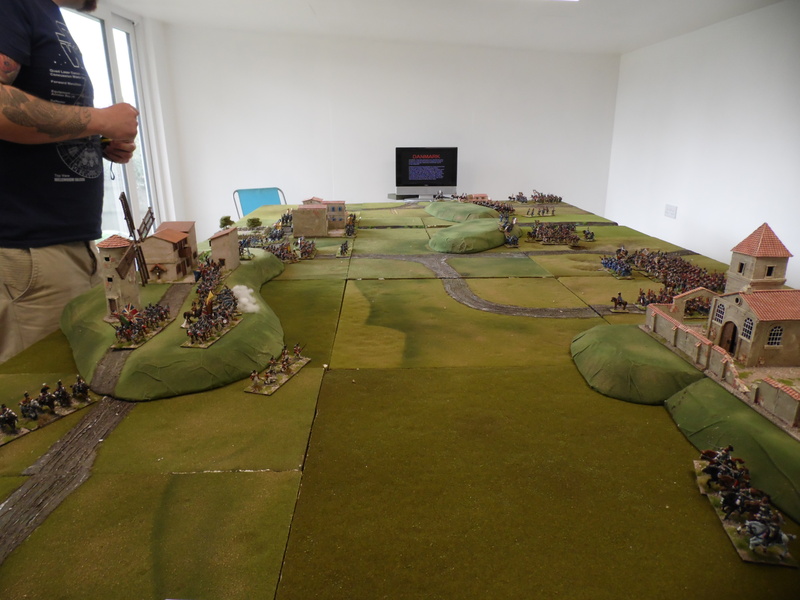 Have a look out for some photos of our game in Wargames Illustrated as their photographer took a few for the magazine. Hopefully see you next year. I will amend the rules to version 2 soon and go through an few more examples to help explain my rationale behind them. Hope you enjoy the pictures and write up.